Cell fate determination during development often requires morphogen transport from producing to distant responding cells. Hedgehog (Hh) morphogens present a challenge to this concept, as all Hhs are synthesized as terminally lipidated molecules that form insoluble clusters at the surface of producing cells. While several proposed Hh transport modes tie directly into these unusual properties, the crucial step of Hh relay from producing cells to receptors on remote responding cells remains unresolved. Using wing development in Drosophila melanogaster as a model, we show that Hh relay and direct patterning of the 3–4 intervein region strictly depend on proteolytic removal of lipidated N-terminal membrane anchors. Site-directed modification of the N-terminal Hh processing site selectively eliminated the entire 3–4 intervein region, and additional targeted removal of N-palmitate restored its formation. Hence, palmitoylated membrane anchors restrict morphogen spread until site-specific processing switches membrane-bound Hh into bioactive forms with specific patterning functions. Each cell in a developing embryo receives information that determines what type of body structure it will form. In fruit flies, this information is partly given by a protein called Hedgehog. In the embryo cells that receive it, Hedgehog can trigger a series of events which activate certain genes and thereby regulate structure formation. The Hedgehog proteins are produced by a different organizing group of cells: from there they transport within the embryo, creating a gradient. Depending on where a responding cell is in the embryo, it receives a different amount of Hedgehog, which gives the cell its identity. For example, Hedgehog proteins form a gradient across a fruit fly’s developing wing, which creates a visible vein pattern. How Hedgehog proteins form gradients is enigmatic, however, because once produced, they cling to the cells that created them. The reason for this unusual behavior is that the two ends of the Hedgehog protein are attached to a different fat molecule. In particular, one extremity is linked to a fat molecule called palmitate. These ends’ fatty additions anchor Hedgehog to the cells that produced them. Then, the tethered proteins gather together to form chain-like clusters where they inactivate each other: the extremity with the palmitate ‘hides’ the portion of the neighboring protein that binds to the receiving cells. It is still unclear how Hedgehog can be activated and released to reach these faraway cells. One hypothesis is that an enzyme comes to the clusters and frees the proteins by cutting both of Hedgehog’s fatty anchors. Thanks to how the palmitate tethers Hedgehog to the cell, the protein is positioned in such a way that when the enzyme makes its snip, the binding site on the neighboring Hedgehog gets exposed: this protein is activated and, when also cut by the enzyme, released. Here, Schürmann et al. create an array of mutant Hedgehog proteins – for example some without palmitate, some with palmitate that cannot be removed by the enzyme – and study how they affect the development of the wing’s pattern in the fruit fly. Coupled with the imaging of the clusters, these experiments support the hypothesis that the palmitate anchor is necessary so that Hedgehog proteins can be turned on before diffusing away. The Hedgehog family of proteins is also present in humans, where it presides over the development of the embryo but is also involved in cancer. Understanding how Hedgehog works in the fruit fly could lead to new discoveries in humans too. Hedgehog (Hh) morphogens are dually lipidated 19 kDa proteins that are firmly anchored to the cell membrane of producing cells. Production of all active Hhs begins with autocatalytic cleavage of a precursor molecule by its C-terminal cholesterol transferase domain (Porter et al., 1996b). This results in cholesteroylated vertebrate Sonic hedgehog (Shh) and Drosophila Hh. Next, Hh acyltransferase (Hhat, also designated Skinny hedgehog or Raspberry) attaches a palmitoyl group to a conserved N-terminal cysteine that becomes exposed after signal peptide cleavage (Chamoun et al., 2001; Lee and Treisman, 2001; Micchelli et al., 2002). Hh palmitoylation is critical for later signaling, demonstrated by mutation of the N-terminal cysteine to serine or alanine (C25 > A/S in ShhC25A/S, C85 >A/S in Drosophila HhC85A/S) which abolishes palmitoylation and results in morphogen inactivity (Chamoun et al., 2001; Chen et al., 2004; Dawber et al., 2005; Goetz et al., 2006; Kohtz et al., 2001; Lee et al., 2001; Pepinsky et al., 1998). However, why N-palmitoylation is required for Hh signaling in vivo is still unclear. Another unusual feature of all Hhs is their multimerization at the surface of producing cells which requires binding to the long, unbranched heparan sulfate (HS) chains of cell surface HS proteoglycans (HSPGs) called glypicans (Chang et al., 2011; Ortmann et al., 2015; Vyas et al., 2008). The Hh cholesterol modification is sufficient to drive this process (Feng et al., 2004; Gallet et al., 2006; Koleva et al., 2015; Ohlig et al., 2011). 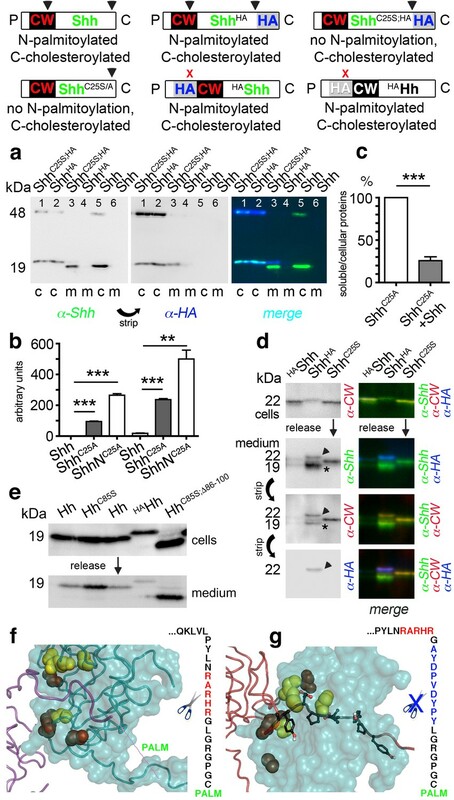 Despite membrane anchorage and cell-surface HS association, the multimeric Hhs initiate the Hh response in distant cells that express the Hh receptor Patched (Ptc). The question of how dual-lipidated Hh clusters manage to travel and signal to remote target cells is intensely investigated. The most current models propose lipidated Hh transport on filopodia called cytonemes (Bischoff et al., 2013; Sanders et al., 2013) or on secreted vesicles called exosomes (Gradilla et al., 2014) to bridge the distance between Hh-producing and receiving cells. Hh release through cell-surface-associated proteases, called sheddases, has also been suggested. In vitro, membrane-proximal shedding not only releases Hh ectodomains from their lipidated N-terminal peptides (Dierker et al., 2009; Ohlig et al., 2011) but also activates Hh clusters. This is because N-terminal lipidated peptides block adjacent Hh-binding sites for the receptor Ptc and, thereby, render Hh at the cell membrane inactive. 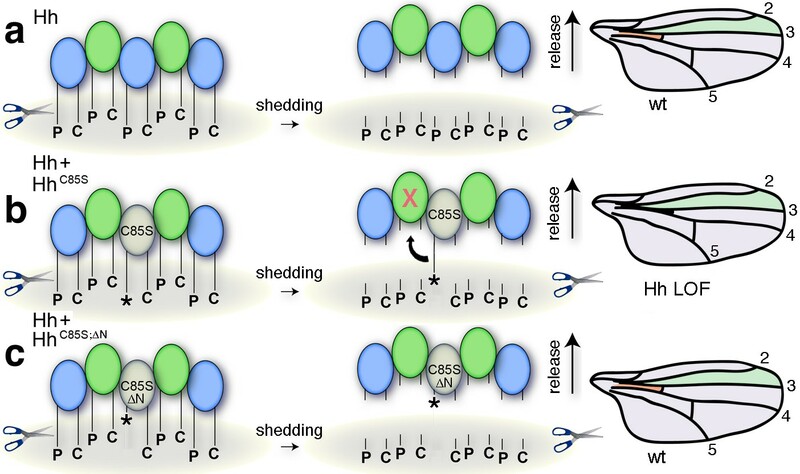 By cleaving these inhibitory peptides during release, sheddases unmask Ptc binding sites of solubilized clusters and thereby couple Hh solubilization with its bioactivation. In this model, the N-palmitate plays two indirect roles for Hh biofunction: first, it ensures reliable membrane-proximal positioning of inhibitory N-terminal peptides as a prerequisite for their efficient proteolytic processing, and second, by its continued association with the cell membrane, it ensures that only fully processed (=activated) Hh clusters are released. This model therefore predicts that inhibition of N-palmitoylation will result in release of inactive soluble proteins with masked Ptc-binding sites (Jakobs et al., 2014; Jakobs et al., 2016; Ohlig et al., 2011; Ohlig et al., 2012). It also predicts that impaired or delayed processing of dual-lipidated Hh will strongly reduce its release and bioactivity in vivo. By uncovering a dominant negative, cell-autonomous function of non-palmitoylated HhC85S in endogenous Hh, we here support the first prediction. By using a series of transgenic Drosophila melanogaster lines that express untagged Hh, biologically inactive HhC85S, or N-truncated variants thereof in posterior and anterior wing disc compartments, we provide strong evidence that Hh clusters form by direct protein-protein contact and that unprocessed N-terminal peptides block Ptc binding of adjacent endogenous Hhs. As a consequence, we suggest that, due to their reduced activity, soluble clusters with masked Ptc-binding sites impair direct patterning of the 3–4 intervein region of the wing. Supporting this mechanism, targeted deletion on non-palmitoylated inhibitory peptides restores 3–4 intervein formation. We also show that impaired or delayed processing of lipidated Hh strongly reduces its solubilization, and hence its bioactivity, in vivo. We demonstrate that the HS-binding Cardin-Weintraub (CW) motif serves as the preferred N-terminal Hh processing site in vivo, and that impaired processing of this site completely abolishes direct 3–4 intervein wing patterning. Additional targeted deletion of N-palmitate restores wing patterning, demonstrating that one role of palmitoylated membrane anchors is to prevent the release of un- or incompletely processed Hh clusters in vivo. 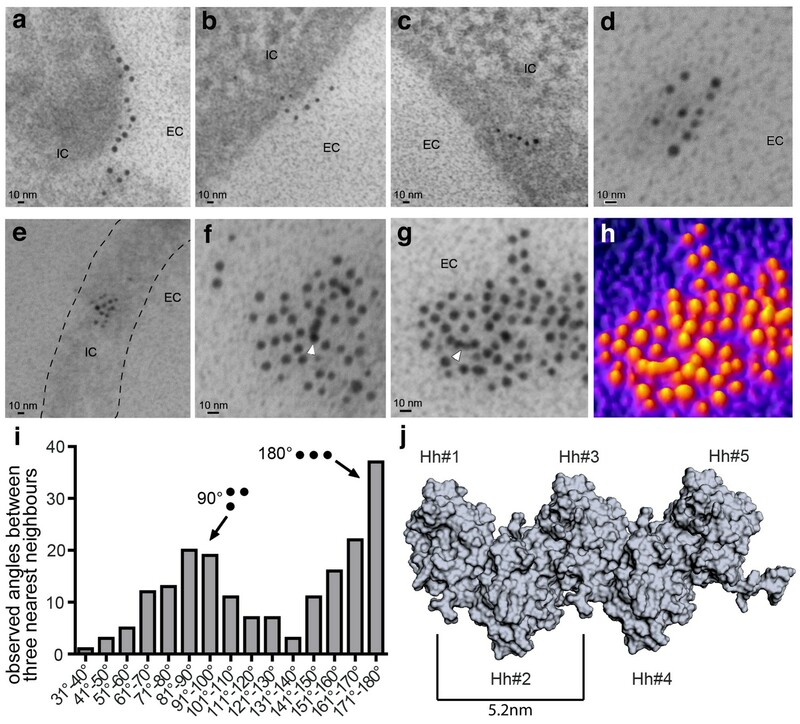 These genetic data are supported by the nano-structure of Hh clusters as revealed by immunoelectron microscopy (IEM) and provide new insights into how Hh relay from the producing cell membrane or between membranes could be achieved. A first step in decoding possible Hh solubilization modes is to characterize the composition and organization of Hh substrates. It has been previously shown that Hh forms light microscopically visible clusters at the surface of producing cells (Chen et al., 2004; Gallet et al., 2006; Ortmann et al., 2015; Sanders et al., 2013; Vyas et al., 2008). However, the nanoscale structure of these heteroprotein complexes has not been determined. We therefore expressed Shh together with Hh acyltransferase in HEK293-derived Bosc23 cells to produce authentic cell surface Hh clusters for IEM analysis. To this end, we used several different α-Shh antibodies and secondary antibodies conjugated to 5 nm or 10 nm gold particles. Three α-Shh antibodies detected Shh in variably sized cell surface clusters, with the largest complexes exceeding sizes of 100 nm. Notably, as shown in Figure 1a–h and Figure 1—figure supplement 1, many clusters consisted of linear arrangements (Figure 1a–d) or contained linear arrays of closely packed gold particles (Figure 1f,g, arrowheads). Nearest-neighbour analysis of the angular distribution between the three most proximal gold particles (Figure 1i) confirmed that most arrangements were rectangular (90°) or linear (180°), the latter being consistent with Hh multimerization using linear HS chains of glypican HSPGs as templates (Chang et al., 2011; Vyas et al., 2008; Schuermann et al., 2018). Hh linearization during cell-surface multimerization is further consistent with previous structural and biochemical data which suggest a zig-zag arrangement of Hh monomers (Figure 1j) and variably sized Drosophila Hh and vertebrate Shh, ranging from 80 kDa to 600 kDa (Chang et al., 2011; Chen et al., 2004; Jakobs et al., 2014; Ohlig et al., 2011; Ohlig et al., 2012). We therefore next aimed to genetically confirm direct Hh clustering in vivo by using Drosophila melanogaster wing development as a model. Immuno-TEM analysis of Shh clusters at the Bosc23 cell surface (a–g). α-Shh immunogold labeling suggests that Shh forms linear arrangements (EC: extracellular; IC: intracellular). Shh and Hh acyltransferase were coexpressed in Bosc23 cells and cell-surface-associated clusters visualized by two independent α-Shh antibodies and 5 nm and 10 nm immunogold-labeled secondary antibodies. Note Shh clusters on cellular extensions (dashed line in e) and continuous immunogold labeling in cell-surface aggregates (f,g, white arrowheads) consistent with linear Shh clustering. (h) 3D heat map conversion of the cell-surface cluster shown in g. Bright yellow indicates 5 nm and 10 nm gold, and dark colors represent the background. (i) Quantification of angular distributions of the three most adjacent gold particles within clusters confirm non-random Shh clustering. 187 angles in 20 individual cell-surface clusters were analyzed. (j) Hh pentamer model. Hh monomers form extended zigzag chains (Ohlig et al., 2011). The fly wing develops from the imaginal wing disc (Figure 2a, bottom). The wing primordium at the center of the wing disc differentiates into the wing blade proper, which shows a characteristic pattern of five longitudinal veins (L1-5), an anterior cross vein (connecting L3 and L4) and a posterior cross vein (connecting L4 and L5) (Figure 2a, top) (Hartl and Scott, 2014). The anterior/posterior (a/p) boundary is located slightly anterior to the position of L4 in the adult wing (Figure 2a, red dashed line). HhC85S expressed in the posterior wing disc compartment, but not in the anterior compartment, dominantly represses the formation of Hh-dependent wing structures (a) Drosophila third-instar wing disc and adult wing. An en >GFP control wing disc and wing are shown. The posterior en-expression domain of the wing disc is labeled in green. Adult wings are shown with anterior up and proximal left. Longitudinal veins L1-L5, the anterior cross vein (acv) and the posterior cross vein (pcv) are marked. The anterior (a)/posterior (p) compartment border is shown as a red dashed line. (b) Schematic of transgenic constructs. P: palmitate, C: cholesterol, CW: Cardin-Weintraub motif. (c) Hh overexpression under en-control (en >Hh) expands the anterior L3-L4 intervein region. (d) en >HhC85S: L3 and L4 appose proximally; the acv is lost. (e,f) To quantify Hh activity, the most proximal L3-L4 areas highlighted in orange were determined and the values obtained divided by the L2-L3 areas. ***p≤0.001, **p≤0.01, n = 20. (g,h) Ptc-controlled GFP and HhC85S expression in the anterior (Hh-receiving) wing disc compartment at the a/p border (red stripe) do not impair wing development. (i) Left: Proposed mixed composition of morphogen clusters upon transgenic HhC85S (gray) expression in the posterior compartment that simultaneously produces the wild-type morphogen (green). Here, the N-terminal peptide of one molecule in the chain blocks the Ptc-receptor-binding site (red) of the adjacent molecule in the chain. Shh crystal lattice interactions (pdb: 3m1n) are shown to illustrate a possible cluster structure. Right: HhC85S expression in the anterior compartment (under ptc control) prevents the assembly of mixed morphogen clusters, leaving endogenous Hh function unimpaired. Hh is produced in the posterior wing disc compartment under the control of the transcription factor Engrailed (en) (Tabata et al., 1992; Zecca et al., 1995), which acts indirectly on Hh expression through the repression of the transcriptional Hh repressor Cubitus interruptus (Ci) (Bejarano and Milán, 2009). Hh then moves across the a/p boundary into the anterior compartment, where it binds to Ptc (Ingham et al., 1991). During its movement, Hh forms a gradient of decreasing concentration with increasing distance from the a/p border which corresponds to differential activation of different Hh target genes. Up to ten cell diameters from the a/p boundary, high Hh levels directly pattern the central L3-L4 region of the wing (Mullor et al., 1997; Strigini and Cohen, 1997) by stabilizing Ci155. More distal regions, up to 12–15 cell diameters from the a/p border, depend on Dpp, which is secreted in a stripe just anterior to the a/p boundary in response to low Hh levels. 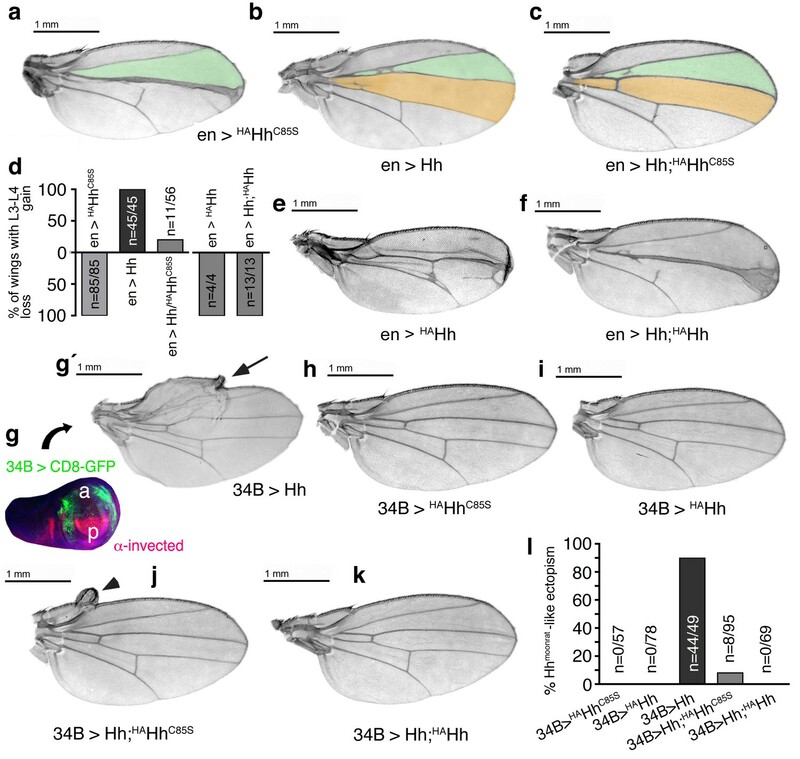 Hh thus plays a role in Drosophila wing patterning by controlling the spatially defined expression of target genes at the a/p border. We exploited the Hh-regulated wing patterning response as a simple and reliable in vivo assay to test the functional consequences of proteolytic Hh processing. Specifically, we addressed the formation and positioning of longitudinal L3-L4 veins, and investigated whether Hh proteolytic processing in cells of the posterior compartment is a prerequisite for its signaling activity in cells of the anterior compartment (Crozatier et al., 2004). To this end, comparable amounts of Hh and Hh variants (Figure 2b, Supplementary file 1) were expressed from one specific attP 51C landing site on the second chromosome (Bateman et al., 2006) using the Gal4/UAS system (Brand and Perrimon, 1993). In the posterior compartment, Hh was expressed under en-Gal4 control, which is referred to as en >Hh, while in the anterior compartment, Hh was expressed in a stripe of cells under ptc-Gal4 control, referred to as ptc >Hh. As previously shown (Crozatier et al., 2004; Lee et al., 2001; Mullor et al., 1997; Strigini and Cohen, 1997), en >Hh expanded the L3-L4 intervein area and, as a concomitant effect, reduced the L2-L3 intervein space (Figure 2c). By contrast, en-regulated overexpression of non-palmitoylated, biologically inactive HhC85S (en >HhC85S) resulted in L3-L4 veins being proximally apposed and the formation of ectopic anterior cross veins (Figure 2d) (Crozatier et al., 2004; Lee et al., 2001), suggesting that HhC85S competes with bioactive wild-type Hh (Lee et al., 2001). This phenotype is consistent with the higher Hh concentrations required for activation of the target genes, ptc and collier, and L3-L4 development, than those required for the activation of dpp, which patterns the remainder of the wing (Hooper, 2003; Méthot and Basler, 1999; Mohler et al., 2000; Strigini and Cohen, 1997; Vervoort et al., 1999). Wing phenotypes were quantified by dividing the proximal L3-L4 areas by the L2-L3 areas (Figure 2e,f). This revealed significant Hh gain of function upon Hh overexpression in the posterior compartment or loss of function upon HhC85S overexpression (en >GFP served as a normal control: L3-L4/L2-L3 = 0.074 ± 0.002; en >Hh = 0.108 ± 0.005 (+46%), p<0.0001; en >HhCC85S=0.032 ± 0.002 (-57%), p<0.0001). To investigate the molecular basis of the dominant-negative HhC85S activity in wing disc tissues, we spatially disconnected HhC85S expression from endogenous Hh expression by using ptc >HhC85S. In the event that biologically inactive HhC85S would impair the response to Hh in a non-cell autonomous manner, for example, by binding to and blocking the receptor Ptc, ptc >HhC85S wing phenotypes should be comparable, or even more severe than those observed in en >HhC85S wings. Alternatively, if unprocessed N-terminal HhC85S peptides directly inhibit Ptc binding of associated endogenous Hh produced in the same compartment, we expected ptc >HhC85S wing phenotypes to be less severe than those observed in en >HhC85S wings. Indeed, HhC85S expression under ptc control had little effect on wing development (Figure 2g,h: ptc >GFP: 0.084 ± 0.001, ptc >HhC85S: 0.078 ± 0.002 (-7%), p=0.0026), suggesting that HhC85S cell-autonomously interferes with endogenous Hh, possibly by the random mixing of inactive HhC85S and wild-type Hh at the cell surface (Figure 2i, left). In this mixed association, unprocessed HhC85S N-terminal peptides block wild-type Hh-receptor-binding sites in trans. By contrast, ptc>HhC85S expression in the anterior compartment prevents mixed cluster formation and therefore does not affect the controlled secretion and signaling of endogenous Hh (Figure 2i, right). To independently confirm that HhC85S dominant-negative function requires direct Hh/HhC85S association with the same clusters, we expressed unlipidated monomeric HhNC85S (Porter et al., 1996a) in vitro and in vivo (Figure 3a). We observed that the expression of soluble HhNC85S under en-control did not affect endogenous Hh function in vivo (Figure 3b), as expected from its exclusion from lipidated Hh clusters at the cell surface. As shown in Figure 3c, relative L3-L4/L2-L3 ratios obtained from three independent HhNC85S lines (1-3) revealed that wing development was not significantly affected (en >GFP: 0.074 ± 0.002, en >HhNC85S (1): 0.07 ± 0.001 (-5%) (p=0.0707), en >HhNC85S (2): 0.074 ± 0.001 (±0%) (p=0.9419), en >HhNC85S (3): 0.075 ± 0.002 (+1%) (p=0.6050), 20 wings were quantified in each line). Notably, HhNC85S expression under ptc control resulted in a small, yet significant gain-of-function phenotype (Figure 3d,e, ptc >GFP: 0.084 ± 0.001, ptc >HhNC85S (1): 0.091 ± 0.002 (+8%) (p=0.0013), ptc >HhNC85S (2): 0.089 ± 0.002 (+6%) (p=0.0348), ptc >HhNC85S (3): 0.093 ± 0.001 (+11%) (p<0.0001), 20 wings were quantified in each line). This is consistent with the concept that Hh inactivation by adjacent unprocessed N-terminal peptides in trans is restricted to clustered, but not unclustered proteins (Ohlig et al., 2011; Ohlig et al., 2012). We conclude that the lack of Hh inhibition by monomeric HhNC85S (Figure 3f), even if expressed in the same cells, is consistent with required direct association of palmitoylated and non-palmitoylated morphogens for dominant-negative HhC85S function. 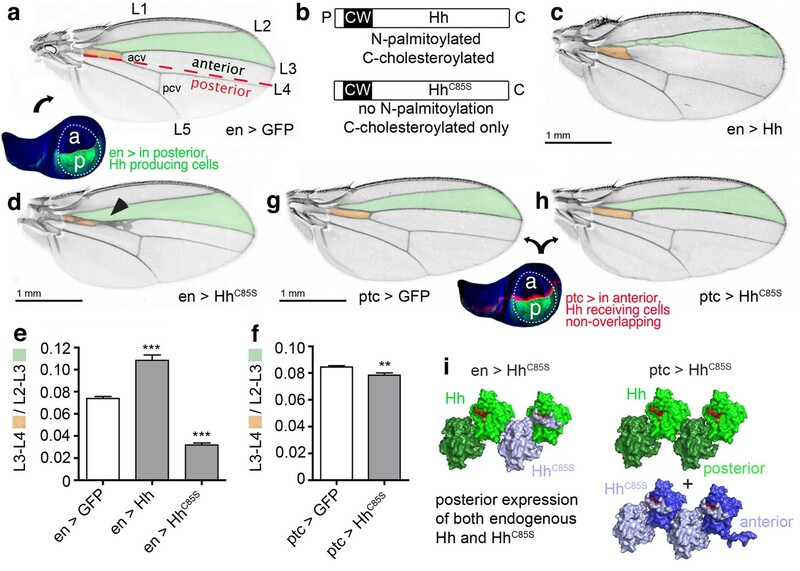 Unlipidated monomeric HhNC85S does not repress the formation of Hh-dependent wing structures. (a) Schematic of HhNC85S and compared expression of recombinant Hh, HhC85S and HhNC85S in Drosophila S2 cells. Proteins were detected by α-Hh antibodies. 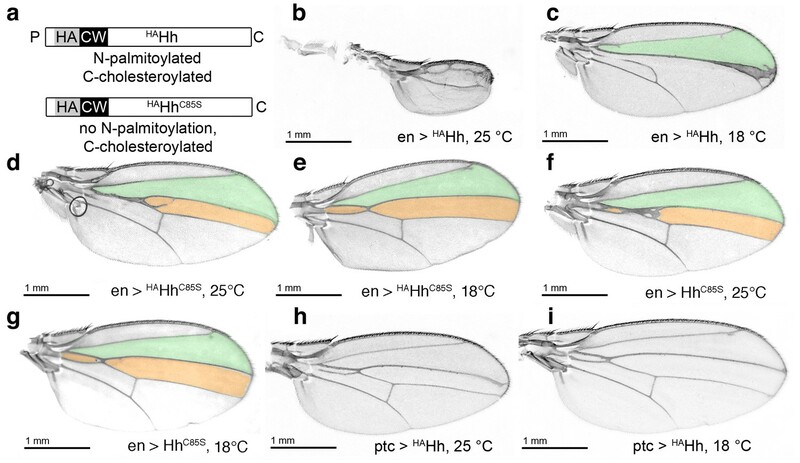 (b) Unimpaired Drosophila wing formation upon en-controlled HhNC85S overexpression at 25°C. A representative result from one of four independently derived HhNC85S fly lines is shown. (c) Relative L3-L4/L2-L3 intervein ratios of three independent HhNC85S fly lines (1-3) are expressed as a quantitative readout for Hh patterning activity. ***p≤0.001, **p≤0.01, *p≤0.05, n.s. (not significant): p>0.05, n = 20. (d) Drosophila wing formation upon ptc-controlled HhNC85S overexpression at 25°C. (e) Relative L3-L4/L2-L3 intervein ratios of three independent HhNC85S fly lines (1-3). ***p≤0.001, **p≤0.01, *p≤0.05, n.s. (not significant): p>0.05, n = 20. (f) Gel filtration analysis of HhC85S and HhNC85S expressed in Drosophila larvae under en-control. Multimeric HhC85S eluted in fractions 3–8, corresponding to molecular weights of 70 kDa-600 kDa, as expected. By contrast, HhNC85S eluted in fractions 10–12 (corresponding to 19 kDa monomers). Elution profiles are expressed relative to the highest protein amounts detected, which were set to 100%. n = 3. Bottom: Proposed generation of endogenous Hh clusters (green) at the posterior cell surface that are devoid of monomeric soluble HhNC85S. We next determined the molecular basis of the cell-autonomous inhibitory activities of HhC85S. In vitro, N-terminal peptides block Ptc-receptor-binding sites of adjacent Hh molecules in the cluster in trans (Figure 4—figure supplement 1a–c) (Ohlig et al., 2011). Thus, we predicted that N-terminal truncation of HhC85S should restore Hh biofunction in mixed clusters. To test this idea and to mimick Hh processing observed in L3 Drosophila larvae (Figure 4—figure supplement 1d,e), we consecutively deleted N-terminal amino acids 86–91 (HhC85S;Δ86-91) to 86–100 (HhC85S;Δ86-100) (Figure 4a) and confirmed unimpaired protein expression (Figure 4b) and multimerization (Figure 4—figure supplement 2). All ten constructs were then inserted into the attP-51C landing site on the second chromosome to ensure comparable expression. At least three independent transgenic fly lines were derived from each construct and crossed with the en-Gal4 driver line. We observed unchanged or moderately changed L3-L4/L2-L3 intervein ratios between en >HhC85S and en >HhC85S;Δ86-91 to en >HhC85S;Δ86-97 adult wings (Figure 4c–e,i and Figure 4—figure supplement 3a). However, protein truncation beyond residue R97 gradually restored the biological activity of mixed clusters: en >HhC85S;Δ86-98 and en >HhC85S;Δ86-99 fly wings showed partially restored wing patterning (Figure 4f,g,i) and, strikingly, the posterior expression of HhC85S;Δ86-100 fully restored normal wing patterning (Figure 4h,i and Figure 4—figure supplement 3a). Cell-autonomous inhibitory activities of HhC85S and restored wing patterning upon targeted coexpression of en >HhC85S;Δ86-100 were confirmed with the independent en-driver lines en(2)-Gal4 and hh-Gal4, both controlling transgene expression in the wing disc (Figure 4—figure supplements 4 and 5). These results are consistent with the assembly of Hh clusters by direct protein-protein contacts as a prerequisite for the inhibitory activity of unprocessed N-terminal peptides. N-terminal truncation of palmitoylation-deficient HhC85S rescues wing formation. (a) All truncated proteins also lacked the N-terminal cysteine, preventing Hh palmitoylation (Hardy and Resh, 2012). Residues #93–97: CW motif. (b) All proteins were expressed and secreted from S2 cells, as determined by immunoblotting. (c–h) En-regulated overexpression of HhC85S and N-terminally truncated proteins (HhC85S;Δ). Unaffected wing development despite en-regulated expression of unpalmitoylated HhC85S;Δ86-100 (h). (i) Quantification of wings shown in c-h. En-regulated GFP and HhC85S expressions served as positive and negative controls, respectively. Pooled analysis of three transgenic fly lines, each derived from an independent injection. en >HhC85S: 0.032 ± 0.001, en >HhC85S;Δ86-91: 0.035 ± 0.001 (p=0.1375), en >HhC85S;Δ86-93: 0.031 ± 0.001 (p=0.5458), en >HhC85S;Δ86-94: 0.028 ± 0.001 (p=0.0134), en >HhC85S;Δ86-95: 0.028 ± 0.001 (p=0.001), en >HhC85S;Δ86-96: 0.034 ± 0.001 (p=0.25), en >HhC85S;Δ86-97: 0.035 ± 0.001 (p=0.117), en >HhC85S;Δ86-98: 0.041 ± 0.001 (p<0.0001), en >HhC85S;Δ86-99: 0.057 ± 0.001 (p<0.0001); en >HhC85S;Δ86-100: 0.076 ± 0.0007 (p=0.0001), en >GFP: 0.074 ± 0.002. ***p≤0.001, n.s. (not significant): p>0.05, n = 60 (n = 20 per line), all flies developed at 25°C. We also observed that wing phenotypes varied between and within fly lines (labeled 1–4 in Figure 4—figure supplement 3b). This variability can be explained by slightly different expression levels or by small stochastic changes in Hh/HhC85S cluster composition with increasing relative amounts of HhC85S, resulting in stronger dominant negative phenotypes. Indeed, temperature-dependent Gal4-regulated transgene amounts (Duffy, 2002) affected dominant-negative wing phenotypes: At 29°C, increased amounts of HhC85S relative to (fixed) endogenous Hh inhibited Hh function more strongly, whereas reduced transgene expression at 18°C inhibited Hh function less strongly (Figure 4—figure supplement 6). Taken together, we conclude that N-palmitate serves to ensure reliable membrane-association of inhibitory N-termini, making quantitative peptide processing a prerequisite for the solubilization of fully activated clusters (Figure 5a). As a consequence, Hh concentrations at any position in the gradient will strictly correlate with their biological activities (i.e. their Ptc-binding capacities). Impaired N-palmitoylation in this scenario reduces Hh bioactivity to variable degrees, depending on the relative number of unprocessed N-terminal peptides in soluble clusters (Figure 5b). This essential ‘cleavage/activation control’ function is confirmed by fully restored Hh biofunction upon targeted coexpression of en >HhC85S;Δ86-100 (Figure 5c). Simplified model for the conversion of membrane-bound Hh into soluble clusters. Surface-tethered wild-type Hh monomers (colored green and blue for clarity) form multimeric clusters with their extended N- and C-terminal lipidated peptides tethered to the cell membrane. (a) Membrane-proximal proteolytic processing (scissors) removes lipidated membrane anchors and releases Hh clusters from posterior cells. As a consequence, protein concentrations at any position in the responsive (anterior) field correlate with their biological activities (their Ptc-receptor-binding capacities). Because partially processed clusters are not released, the role of both lipids at this point is to control quantitative Hh processing and bioactivation. (b) Unpalmitoylated HhC85S only requires processing of its cholesterylated C-terminus for release: As a consequence, a fraction of wild-type Hh in mixed clusters has its Ptc-receptor-binding sites and bioactivity blocked (indicated by the X) by unprocessed adjacent HhC85S N-termini (asterisk). Signaling at any position in the field is thus reduced, leading to dominant negative wing phenotypes (right). LOF: loss of function. (c) Artificial truncation of unpalmitoylated HhC85S N-termini restores wild-type Hh function. wt: wild type. In our model, N-palmitate tethers incompletely processed Hh clusters to the cell membrane to prevent their release. To test this hypothesis, we utilized a cell culture model employing Bosc23 cells. To achieve quantitative Hh N-palmitoylation in vitro, we used bicistronic mRNA constructs to couple Shh (the vertebrate Hh ortholog) and Hh acyltransferase expression in the same cells. We then compared the release of fully lipidated Shh, non-palmitoylated ShhC25S, and variants carrying the extended C-terminal membrane anchor N190SVAAKSG-YPYDVPDYA-G198 (G198 represents the cholesterol-modified glycine; italicized underlined letters represent the tag, Figure 6) (Jakobs et al., 2014). Proteins were detected by polyclonal α-Shh antibodies and monoclonal α-HA antibodies on the same (stripped) blots. Grayscale blots were inverted, colored (green: α-Shh signal, blue: α-HA signal) and merged to identify proteins bound by both antibodies (yielding bright blue/cyan signals) and proteins bound by only α-Shh antibodies (green signals). N-palmitoylation controls Hh morphogen release in vitro. Top: Schematics of transgenes. Arrowheads indicate cleavage sites, the x denotes blocked cleavage. (a) Palmitoylated vertebrate Hh orthologs Shh and ShhHA and non-palmitoylated ShhC25A;HA were expressed in Bosc23 cells, and the proteins in the cellular (c) and corresponding soluble fractions (m) were analyzed by immunoblotting. To better demonstrate protein processing during release, we inverted grayscale blots and colored them (right: green: α-Shh, blue: α-HA). Green signals label untagged or processed Shh, and cyan signals label unprocessed HA-tagged proteins. Higher electrophoretic mobility confirms terminal processing during release. Tagged and untagged palmitoylated proteins are not efficiently released. (b) Compared dual-lipidated, monolipidated and non-lipidated Shh release after 1 hr (left) and 4 hr (right). ***p≤0.0001, **p≤0.001, n = 3. (c) Release of ShhC25A is downregulated 4-fold upon dual-lipidated Shh coexpression (27.7 ± 4.6% if compared to ShhC25A release alone, which was set to 100%, n = 7, ***p≤0.0001). (d) Impaired release of N-terminally HA-tagged HAShh. α-CW antibodies detect the N-terminal CW motif (KRRHPKK). Bright cellular signals in merged blots denote unprocessed proteins (arrowhead), orange signals denote C-processed/N-unprocessed proteins, and green signals confirm the removal of N- and C-terminal peptides (asterisk). Note ShhHA processing at the CW site during release. By contrast, N-terminal processing of ShhC25S is impaired. (e) Immunoblot analysis of recombinant Hh proteins released into media of transfected Drosophila S2 cells (left). Top row: S2 cells express palmitoylated and non-palmitoylated proteins to comparable levels. Bottom row: S2 cells released high levels of unpalmitoylated HhC85S and HhC85S;Δ86-100, and lower levels of palmitoylated Hh, into the media. Only very low levels of HAHh were released in unprocessed form (top band). (f) Intermolecular interactions of Drosophila Hh N-terminal peptides. Right: schematic of the palmitoylated N-terminal ‘stem’ peptide, including basic CW residues (red) serving as the predicted membrane-proximal cleavage site. (g) Modeled insertion of the HA tag upstream of the N-terminal CW motif (located between Hh residues L91 and G92) of Drosophila Hh. This moves the CW motif nine amino acids more distal to the membrane and replaces its previous position with the HA tag (blue, right). Modeled N-terminal palmitate is shown as a zigzag line (pointing to the right). Yellow spheres denote Drosophila Hh residues corresponding to Shh residues that interact with Ptc (Drosophila Hh H193, H194, H200, H240) (Bosanac et al., 2009). Red spheres denote residues corresponding to Shh amino acids bound by the Shh inhibitory antibody 5E1 (K105, R147, R213, R238, R239 in Drosophila Hh) (Maun et al., 2010). As shown in Figure 6a, dual-lipidated Shh and ShhHA yielded strong cellular signals but were absent from media, indicating impaired release. By contrast, non-palmitoylated ShhC25S;HA was effectively converted into a C-terminally truncated soluble morphogen, as indicated by an electrophoretic size shift and lack of α-HA antibody reactivity (compare the cellular (c) material in each lane 1 with corresponding media in each lane 3). Three independent quantifications of dual-lipidated Shh, cholesterylated ShhC25S, and non-lipidated ShhNC25S in cells and media (Figure 6b) confirmed that N-palmitoylation controls protein solubilization in vitro (1 hr release: ShhC25A 94 ± 3 arbitrary units (a.u. ), ShhNC25A 265 ± 10 a.u., p<0.0001, n = 3; 4 hr release: Shh 18 ± 2 a.u., ShhC25A 238 ± 6 a.u., p>0.0001, n = 3, ShhNC25A 500 ± 58 a.u., p>0.001, n = 2; values express ratios between solubilized/cell-associated proteins). Accordingly, coexpression of dual-lipidated Shh and ShhC25A in the same Bosc23 cells resulted in mixed clusters and thereby a four-fold reduction in ShhC25A release (Shh+ShhC25A: 25.7 ± 5%, ShhC25A alone was set to 100%, p<0.0001, n = 7) (Figure 6c). Importantly, we further observed that dual-lipidated, N-terminally HA-tagged HAShh was not released (Figure 6d). In this construct, the HA tag was inserted at the position of the membrane-proximal CW motif, shifting this previously identified sheddase target site (Ohlig et al., 2012) distally while not affecting its HS-binding capacity. To test whether the same modification would also impair release of fly Hh, we inserted an HA tag between corresponding Hh amino acids L91 and G92, resulting in the N-terminal HAHh sequence C85GPGRGL91-YPYDVPDYAG92-RHRARN (bold letters represent the CW motif that is shifted nine amino acids away from the preferred membrane proximal site of sheddase activity). We also used Hh, non-palmitoylated HhC85S and HhC85S;Δ86-100 as controls. HAHh was expressed in S2 cells, its unimpaired multimerization confirmed (Figure 6—figure supplement 1), and cellular and soluble proteins compared by SDS-PAGE and immunoblotting (Figure 6e). We observed that all proteins were produced in S2 cells, as indicated by strong α-Hh antibody binding to all cellular forms. In contrast, only low levels of HAHh that retained the tag were solubilized, suggesting that N-terminal processing was impaired in S2 cells. From these experiments, we conclude that N-palmitoylation controls Hh release from the cell surface and restricts possible modes of Hh solubilization to shedding (Figure 6f,g). We next generated transgenic flies expressing HAHh (Figure 7a) in the posterior compartment. The HA-tagged protein, due to its invariable association with the membrane (Figure 6e) and direct association with endogenous Hh in mixed clusters, was expected to impair endogenous Hh release and to lead to severe dominant-negative mis-patterning phenotypes. Indeed, HAHh expression in the posterior compartment at 25°C largely arrested fly development at the pupal and pharate stages, leading to defective head development characteristic of Hh loss of function (Torroja et al., 2004). Of 230 pharates counted, only three imagos hatched with smaller wings lacking anterior structures (Figure 7b), again characteristic of Hh loss of function (Bejarano et al., 2012). Reduced transgene expression at 18°C largely reversed pharate lethality: 77% of en> HAHh pharates hatched (293 flies from 393 pupae) but wing development was still impaired with all analyzed wings lacking all or most of the L3-L4 intervein area (Figure 7c). This phenotype resembles wing phenotypes of flies expressing non-diffusible HhCD2 (Strigini and Cohen, 1997) or with impaired activity of Hh signaling components such as Fused or Collier (Col) (Ascano and Robbins, 2004; Vervoort et al., 1999), while the distal ‘widening’ of L3 (Figure 7c) is consistent with impaired Hh repression of Iroquois-regulated L3 formation (Crozatier et al., 2004). Notably, the observation that HAHh expression under ptc-control showed only minor effects (Figure 7h,i) confirms cell-autonomous Hh repression by direct HAHh contacts in mixed clusters, and suggests that palmitoylated HAHh peptides restrain these mixed clusters at the cell membrane. We therefore expected that additional C > S mutagenesis, by removing the membrane anchor (Figure 7a), would revert the observed severe mis-patterning phenotypes due to impaired cluster release into milder forms caused by partially impaired Hh binding to Ptc, as described earlier. Indeed, additional mutagenesis of the palmitate acceptor cysteine in en >HAHhC85S flies fully reversed pharate lethality at 25°C and led to wing phenotypes comparable to those of en >HhC85S flies (compare Figure 7d with 7 f and Figure 7e with 7 g). HA tag insertion into the putative N-terminal processing site strongly represses wild-type Hh in vivo. (a) Schematic of HA-tagged Hh constructs. P: palmitate, C: cholesterol, CW: CW motif, HA: HA tag. (b) At 25°C, most flies die at the late larval/early pupal stage. Wings of the few surviving en >HAHh flies show severe dominant-negative Hh loss of function. This phenotype was observed in four fly lines derived from two HAHh integration events each into VK37, 51C and attP integration sites. (c) At 18°C, more flies develop, and L3 and L4 appose into a large central vein. (d,e) Additional deletion of the palmitate acceptor cysteine (HAHhC85S) largely reverses Hh loss of function. At 25°C, wings show proximally apposed L3-L4 veins, and at 18°C, the anterior crossvein is reduced, as previously observed for non-palmitoylated HhC85S. (f,g) Representative en >HhC85S wing phenotypes are shown. (h,i) By contrast, ptc-controlled HAHh expression in the anterior (Hh-receiving) wing disc compartment at 18°C and 25°C mildly affected wing formation. The Hh gradient emanating from the posterior compartment activates the Hh target genes engrailed (en), collier (col), patched (ptc) and decapentaplegic (dpp) in stripes of anterior cells adjacent to the a/p border. Via Hh-responsive accumulation and nuclear access of Ci155, en and col are induced in a 5- to 7 cell wide anterior stripe, ptc in a 10 cell wide stripe and dpp in a 12–15 cell wide stripe, and the presence and width of these stripes of target gene expression is differentially sensitive to Hh dose (Chen and Struhl, 1996; Strigini and Cohen, 1997). Far from the Hh source, Ci155 is depleted to form the repressor CiR, and Hh target genes are repressed. Cells receiving minimal amounts of Hh activate dpp transcription, cells receiving an intermediate amount of Hh activate the expression of col and ptc in addition to that of dpp, and Hh-dependent anterior en transcription (but not posterior, Hh-independent en transcription) is located closest to the a/p border (Figure 8a,b). Col in the high and intermediate zones down-regulates Dpp responses: This results in the future L3-L4 intervein (Mohler et al., 2000; Vervoort et al., 1999). We used this system to investigate the impact of our mutant forms of Hh on the expression of en, ptc and dpp. We confirmed that posterior Hh overexpression expanded dpp-LacZ expression anteriorly (Figure 8c) and, consistent with established en >Hh expansion of the L3-L4 intervein area (Figure 2c), we confirmed that posterior Hh overexpression expanded ptc-LacZ expression in the presumptive L3-L4 region (Figure 8d). En-controlled expression of the HA-tagged protein at 18°C, in contrast, did not much affect dpp-LacZ expression in the anterior compartment (Figure 8e), but abolished all ptc-LacZ reporter expression and restricted en-expression posteriorly (Figure 8f). This confirms that the complete loss of L3-L4 intervein tissue in adult en >HAHh wings is caused by insufficient Hh levels at the a/p border, and supports the idea that coexpressed HAHh impaired Hh release from the posterior compartment of the wing disc. We note that the observed expansion of dpp expression can be best explained by abrogated Ptc-mediated Hh internalization that normally restricts the Hh gradient (Chen and Struhl, 1996). Consistent with our concept of N-palmitate serving as a membrane anchor to prevent unregulated Hh release, HAHhC85S coexpression restored ptc-LacZ and dpp-LacZ expression (Figure 8g,h) to levels comparable to those detected in HhC85S expressing wing discs (Figure 8i,j), and additional deletion of the unpalmitoylated N-terminal peptide reverted the expanded area of dpp-LacZ expression to wild-type range (Figure 8k,l). Together, these experiments confirm that N-terminal Hh processing converts the insoluble Hh cluster into truncated, bioactive morphogen, and that the palmitate anchor controls completion of this process. Effect of different Hh variants on en, dpp-LacZ and ptc-LacZ expression in the wing disc (a,b) Dpp-LacZ (a) and ptc-LacZ (b) reporter gene expression at the a/p border in wild-type third-instar discs. Nuclear β-galactosidase is immunofluorescently labeled (red). Overexpression of CD8-GFP under en-control labels the posterior compartment. Fly larvae developed at 25°C. The left image is a merge. 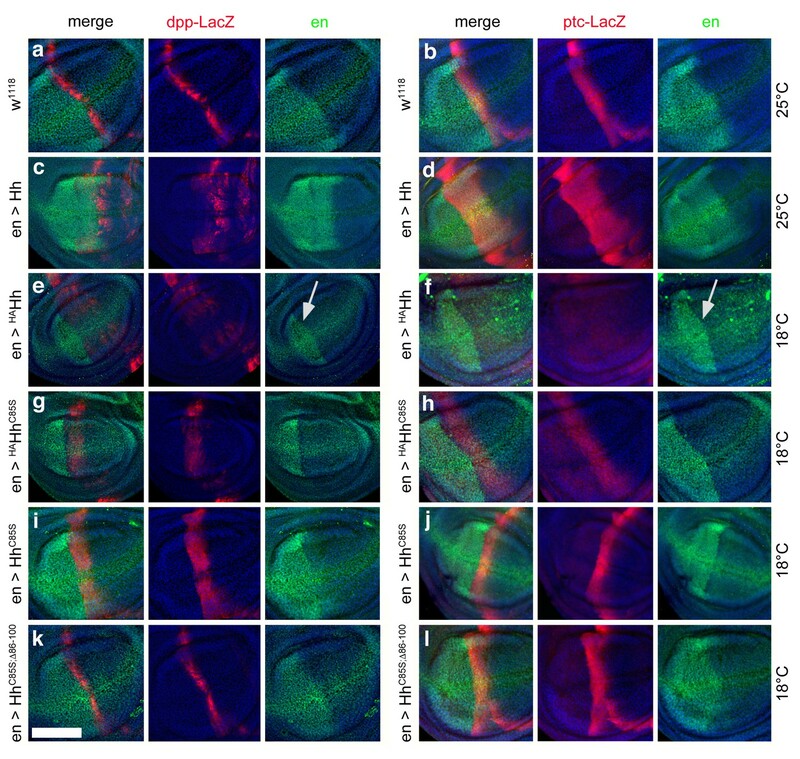 (c,d) Hh overexpression expands dpp-LacZ and ptc-LacZ expression anteriorly. 4D9 α-engrailed/invected (inv) antibodies label the posterior compartment in this and the following panels (green). Fly larvae developed at 25°C. (e,f) En-controlled HAHh overexpression reduced dpp-LacZ expression in the anterior wing disc. Ptc-LacZ expression was always completely abolished, and en/inv expression was restricted to most posterior wing disc regions (arrow). Fly larvae for this and all subsequent analyses developed at 18°C because wing disc growth arrested at 25°C, preventing further analysis. (g,h) Additional deletion of the palmitate membrane anchor increased dpp-LacZ expression and also restored a stripe of weak yet expanded ptc-LacZ expression. The expansion of ptc-LacZ and dpp-LacZ domains beyond wild-type levels may be linked to reduced inv/en expression in anterior target cells (note the unchanged posterior restriction of inv/en-expression). (i,j) En-controlled HhC85S expression leads to comparable dpp-LacZ expression. Ptc-LacZ reporter expression was reverted into more intense and restricted staining, indicating an additional inhibitory effect of the HA-tag. (k,l) Restored wild-type pattern of dpp-LacZ expression and ptc-LacZ expression as a consequence of en-controlled HhC85S;Δ86-100 expression shows that expanded dpp-LacZ expression and reduced ptc-LacZ expression in en >HhC85S and en >HAHhC85S discs were caused by the unprocessed N-terminal peptide. Wing discs are oriented such that anterior is right and dorsal is up; all magnification, camera and processor settings were kept identical. Scale bar: 100 μm. To confirm that impaired processing of palmitoylated Hh variants prevents their solubilization, while impaired processing of unpalmitoylated Hh N-termini affects Ptc receptor binding of soluble clusters (merely reducing their bioactivity), we macroscopically analyzed wings of single and compound transgenic fly lines expressing Hh from the attP 51C landing site on chromosome 2 and HAHh or HAHhC85S from one specific attP2 landing site on chromosome 3. As shown earlier, if expressed under en-Gal4 control, Hh and HAHhC85S strongly affected wing development: En-controlled HAHhC85S reduced the formation of L3-L4 intervein tissue (Figure 9a), and en >Hh expanded the L3-L4 intervein area (Figure 9b). Targeted coexpression of both proteins fully reverted dominant-negative HAHhC85S function in 80% of wings and expanded this area in the remaining 20% of wings (56 wings were analyzed, Figure 9c,d). This indicates that increased Hh amounts ‘titer out’ dominant-negative HAHhC85S function. In contrast, en >Hh did not significantly correct dominant-negative HAHh mis-patterning phenotypes. As previously shown, HAHh expression in the posterior compartment arrested fly development at pupal and pharate stages. All wings of about 4% imagos that hatched (n = 12/320) lacked most anterior structures (Figure 9d,e). Hh coexpression partially reversed pharate lethality (22% imagos hatched, n = 41/182), but all analyzed wings still lacked the complete L3-L4 intervein area (Figure 9d,f). The most likely explanation for this is that increased relative Hh amounts ‘dilute’ the average number of permanent membrane anchors of any given mixed cluster, with only a limited compensatory effect on Hh release and activity due to the remaining tethers. Increased Hh amounts compensate for impaired Ptc binding by unprocessed N-termini, but not for impaired Hh release in vivo. (a) If expressed from chromosome 3 at 25°C, en>HAHhC85S wings show proximally apposed L3-L4 veins. (b) En >Hh wings show enlargement of L3-L4 intervein area. (c) En >Hh;HAHhC85S coexpression reversed en >HAHhCC85S loss of function at 25°C and about 20% of wings showed Hh gain-of-function. Wing phenotypes are shown and quantifications shown in (d). (e) If expressed from chromosome 3 at 18°C, only 4% of en >HAHh flies hatch and show severe dominant-negative Hh loss-of-function phenotypes. (f) Upon Hh coexpression, at 18°C, 22% flies develop with their L3 and L4 always fused into one central vein. (g,g´) 34B-Gal4 expresses UAS-transgenes at the border of the anterior wing disc (green) that does not overlap with the posterior hh-producing disc compartment (red). 34B > Hh expression at 25°C led to clear anterior overgrowth in 90% of wings. (h,i) 34B > HAHhCC85S or HAHh expression did not impair wing development. This again confirmed biological inactivity of both Hh variants. (j) 34B-controlled Hh;HAHhC85S coexpression partially reversed Hh gain-of-function, reducing ectopic overgrowth to a small fraction of wings (8%). (k) 34B > Hh;HAHh coexpression completely reversed Hh gain-of-function. This confirms cell-autonomous Hh repression by direct HAHh contacts in mixed clusters, as quantified in (l). We confirmed cell-autonomous Hh repression by using another Gal4-line (34B-Gal4) that drives transgene expression in cells that form the most proximal parts of the wing where hh is normally not expressed (Figure 9g)(Brand and Perrimon, 1993). 34B-Gal4-controlled Hh expression in these cells results in phenotypes resembling a natural hh gain-of-function allele, hhMoonrat (Figure 9g´, arrow) (Tabata and Kornberg, 1994). Phenotypes resulting from ectopic hhMoonrat expression are usually mild, varying between overgrowth of anterior wing tissue to slight disorganization of the wing margin and the addition of extra vein material. We observed that 34B > HAHhC85S and 34B > HAHh expression did not affect wing development, confirming spatial disconnection of 34B-directed transgene expression from posterior endogenous Hh production and biological inactivity of both proteins (Figure 9h,i). In compound 34B > Hh;HAHhC85S wings, the activity of mixed clusters was reduced (Figure 9j, arrowhead), while it was completely abolished in 34B > Hh;HAHh wings (Figure 9k,l). 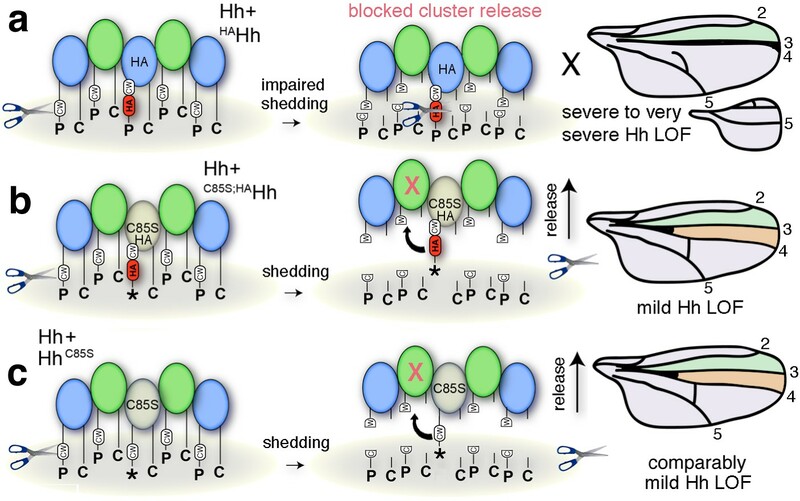 This is expected from impaired Ptc-binding of Hh;HAHhC85S clusters in the former situation versus blocked release of Hh;HAHh clusters in the latter situation. Finally, we investigated the expression of the Hh target gene ptc in flies expressing Hh and HAHhC85S alone and in combination. As shown earlier, posterior Hh overexpression expanded ptc-LacZ expression (compare Figure 10a with Figure 10b), and en-controlled expression of the HA-tagged non-palmitoylated protein strongly reduced ptc-LacZ reporter expression (Figure 10c). Consistent with the restored formation of L3-L4 intervein tissue in adult en >Hh;HAHhC85S wings (Figure 9c), and occasionally gain-of-function in these wings, ptc-LacZ expression in the anterior compartment of the wing disc was expanded (Figure 10d). This shows that coexpressed Hh fully restored dominant-negative HAHhC85S function by expanding ptc-LacZ target gene expression in the presumptive L3-L4 region in the anterior compartment and demonstrates that receiving cells respond to the morphogen. Combined en >Hh;HAHhC85S expression restores ptc-LacZ expression in the wing disc. (a) Ptc-LacZ reporter gene expression at the a/p border in wild-type third-instar discs. Nuclear β-galactosidase is immunofluorescently labeled (red). 4D9 α-engrailed/invected (inv) antibodies label the posterior compartment in this and the following panels (green). The left image is a merge. Fly larvae developed at 25°C. (b) En-controlled Hh overexpression increased and expanded ptc-LacZ expression anteriorly. (c) En-controlled HAHhC85S overexpression reduced ptc-LacZ expression, as previously shown. (d) En-controlled Hh;HAHhC85S coexpression generated a stripe of intense expanded ptc-LacZ staining, consistent with the gain-of-function phenotype observed in wings. Wing discs are oriented such that anterior is right and dorsal is up; all magnification, camera and processor settings were kept identical. Scale bar: 100 μm. Together, these experiments confirm a functional link between Hh lipidation, formation of linear cell surface clusters and proteolytic processing of lipidated N-terminal peptides in vivo. Processing serves to convert the lipidated morphogen cluster at the cell surface into the active form (Figure 11). Therefore, the N-palmitate membrane anchor and membrane-proximal CW-residues are functionally linked since the palmitoylation ensures quantitative CW-cleavage as a prerequisite for full Hh activation in vivo. Simplified model for the impaired solubilization of membrane-bound Hh clusters containing HAHh. 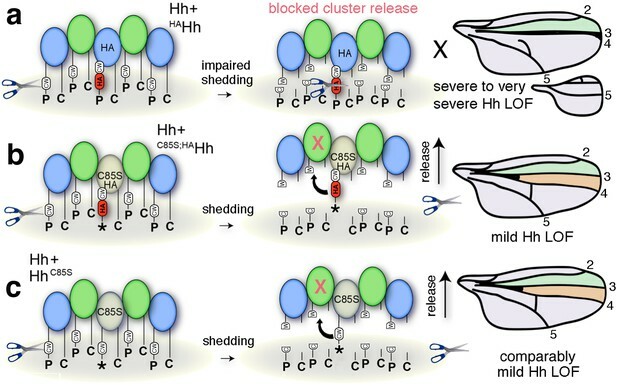 (a) HA insertion in the predicted CW sheddase cleavage site strongly impedes wild-type Hh function. We explain this as completely blocked cell-surface release of all Hh morphogens in mixed clusters also containing unprocessed HAHh. The X indicates blocked proteolytic processing. LOF: loss of function. (b) Additional removal of the N-terminal lipid anchor converts severely impaired wing development (and en >HAHh larval lethality at 25°C) into milder phenotypes characteristic for unprocessed yet soluble clusters containing HhC85S (c). This confirms that the N-terminal lipid anchor acts to control quantitative Hh processing and bioactivation during release and that dominant-negative HhC85S function in wing development is not directly caused by the lack of N-palmitate. It is well established that cell-surface HS chains assist in Hh multimerization as a prerequisite for the generation of light microscopically visible aggregates at the cell surface (Ortmann et al., 2015; Vyas et al., 2008). Here, we provide ultrastructural data showing that a significant fraction of Hh assembles into extended linear arrays, consistent with the long unbranched HS-chain structure that scaffolds Hh clusters (Vyas et al., 2008), observed crystal lattice interactions of the vertebrate Shh ortholog (Pepinsky et al., 1998) and functional in vitro data (Ohlig et al., 2011; Ohlig et al., 2012). By exploiting the Drosophila wing development model which is dependent on differential Hh signaling for the formation of distinct wing structures, we further show that N-terminal peptides can block Ptc-receptor-binding of Hh clusters in vivo. Consistent with this, expression of N-truncated Hh mutants in Drosophila revealed that inhibitory peptide removal unmasks Ptc-binding sites and mediates direct, high threshold tissue patterning (Strigini and Cohen, 1997). Yet, contrary to previous observations on N-truncated Shh (Ohlig et al., 2011), we note that all artificially truncated HhC85S;Δ variants were functionally inert. We explain this inactivity by HhC85S;Δ misfolding due to possible intramolecular chaperone function of the 84 amino acid N-terminal Hh pre-peptide (Eder and Fersht, 1995) or unproductive Ptc binding of artificially truncated proteins as described for monomeric ShhN (Williams et al., 1999). We currently investigate these possibilities by insertion of a tobacco etch virus (TEV) protease recognition site into the putative Hh target site to allow for sequence-specific HhC85S cleavage and activation after controlled TEV protease expression in the fly (Harder et al., 2008). We previously showed that proteolytic conversion targets the N-terminal CW-site in vitro (Dierker et al., 2009; Ohlig et al., 2012). We show here that insertion of HA peptides, which displaces this cleavage site distally without affecting Hh N-palmitoylation (Hardy and Resh, 2012) and HS-dependent multimerization, is sufficient to impair endogenous and transgenic Hh high threshold biofunction in vivo, apparently without affecting low threshold Dpp-mediated Hh activity. Rescue of Hh biofunction by the additional mutation of the cysteine acceptor shows that N-palmitate anchors the unprocessed peptide to the cell membrane to safeguard Hh release. These findings are consistent with enhanced Drosophila Hh release upon RNAi-mediated knockdown of Hh acyltransferase activity (Chamoun et al., 2001) and increased Shh tethering to cell membranes by palmitate (Konitsiotis et al., 2014; Levental et al., 2010). Importantly, while S- and O-linked palmitate moieties are susceptible to enzymatic deacylation by palmitoyl-protein thioesterases (Kakugawa et al., 2015), amide-linked Hh palmitate is thioesterase resistant. This suggests that Hh relay from posterior subcellular structures – at least at some point – requires proteolytic processing of sheddase-accessible, membrane-proximal terminal target peptides. Support for this idea comes from the published replacement of the C-terminal Hh target peptide with transmembrane-CD2 (Strigini and Cohen, 1997). Resulting Hh-CD2 fusion proteins remain permanently membrane associated and generate wings with one single central vein in the region normally occupied by veins L3 and L4, while leaving Dpp-mediated anterior and posterior wing patterning intact. We note that this phenotype is strikingly similar to the en >HAHh phenotype described here. Moreover, required Hh transfer between protruding cell-cell contact structures emanating from the Hh-sending and Hh-receiving compartments, called cytonemes, was recently indicated by impaired Ptc signaling and internalization at contact sites with Hh-CD2 (González-Méndez et al., 2017). While the exact mechanism by which Hh is liberated from the posterior cytoneme membrane was not addressed, proteolytic Hh relay and reception at cytoneme contact sites was suggested by the authors, and is supported by the results shown in our work (Figure 1e). In addition to cytoneme contact sites, other subcellular structures of P-compartment cells release Hh from the membrane (Figure 12). It has been suggested that the Hh gradient in Drosophila wing imaginal discs consists of apical and basolateral secreted pools formed as a consequence of initial apical Hh secretion, subsequent reinternalization, and apical (D'Angelo et al., 2015) or basolateral (Callejo et al., 2011) resecretion, both depending on the endosomal sorting complex required for transport (ESCRT). Pools of Hh and ESCRT proteins are then secreted together into the extracellular space (Gradilla et al., 2014; Matusek et al., 2014; Vyas et al., 2014), Hh being transported on (Bischoff et al., 2013) or inside of (Chen et al., 2017) basolateral cytonemes, or apically released to promote Hh long-range activity (Ayers et al., 2010) (Figure 12). While Hh shedding may target several of these pools, timely and reliable paracrine Hh function through proteolytic release and extracellular apical diffusion alone (Figure 12b’’) is difficult to envision for two reasons. First, patterning of folded epithelia, such as the Drosophila imaginal disc, poses a problem if spreading were to occur out of the plane of the epithelial cell layer through diffusion or flow, as this would result in morphogen loss into the peripodial space and loss of long-range Hh function. The second limitation is that it normally takes much time for diffusing molecules to travel long distances away from the source because the timescale of diffusion increases with the square of the distance (Berg, 1993; Müller and Schier, 2011). Cytoneme- or exosome-mediated basolateral transport, followed by proteolytic Hh relay over short distances at membrane contact sites (González-Méndez et al., 2017), would effectively solve both problems, as would the idea of heparan sulfate proteoglycan ‘restricted’ Hh transport at the apical cell surface (Han et al., 2004). Our future aim is to distinguish between these possibilities. We also aim to characterize the Hh release factor Shifted (Glise et al., 2005), a soluble protein with structural similarities to vertebrate Scube2 sheddase enhancers (Jakobs et al., 2014; Jakobs et al., 2016; Jakobs et al., 2017), to identify the elusive ‘Hh sheddase’. Finally, we are currently investigating the important question of whether C-terminal Hh processing contributes to its in vivo biofunction in the wing disc and in other developing tissues requiring Hh signaling over shorter ranges, such as in the developing eye (Ma et al., 1993). Model of membrane-dependent and membrane-independent Hh protein signaling from posterior producing cells to distant receiving cells and their potential congruency. (a) Schematic of a third instar wing disc with the Hh-producing posterior compartment labeled in green and the Ptc-receptor-producing anterior compartment labeled in orange. The a/p compartment border crossed by spreading Hh is shown as a dashed line. (b) Line drawing of a vertical section of the wing disc at a site marked with a red line in (a). Two pools of Hh are secreted from posterior columnar cells of the wing imaginal disc by different mechanisms (dashed circles). One pool is released from the apical side of the polar epithelium using lipophorins as hydrophilic carriers (b′) (Panáková et al., 2005) or via proteolytic processing of lipidated Hh membrane anchors, as suggested in this work (b′′). Subsequently, unprocessed lipidated Hh or processed ectodomains diffuse through the fluid-filled peripodial space (labeled blue) to bind to Ptc receptors expressed in the anterior compartment. Another pool of apical cell-surface Hh is internalized and re-secreted apically (D'Angelo et al., 2015) or basolaterally (Callejo et al., 2011) using exosomes (b′′′) (Matusek et al., 2014) or long cellular protrusions, known as cytonemes, as carriers. Cytonemes can extend from posterior Hh-producing cells to deliver Hh to cell surface receptors on receiving anterior cells in their close vicinity, or can meet ‘receiving’ cytonemes extending from more distant anterior cells at defined contact sites (b′′′′) (González-Méndez et al., 2017). Receiving anterior cytonemes that take up Hh from basal subcellular sites of expressing posterior cells for subsequent intracellular transport to the apical pole of anterior epithelial cells have also been described (b′′′′′) (Chen et al., 2017). However, an explanation is needed about how lipidated Hh can ‘switch’ between sending and receiving cytonemes, or relay from vesicular or cytoneme membranes to their receptors. This problem may be solved by proteolytic Hh processing, resulting in its relay between cytonemes or from producing cell membranes to Ptc receptors on receiving anterior cells. We note that the findings presented in this work do not support the alternative possibility, that is, that different transport modes work in parallel, because HA insertion into the N-terminal Hh processing site abolished (most) Hh-dependent patterning of the L3-L4 intervein region in a dominant-negative manner. In conclusion, we propose that palmitate-controlled quantitative Hh shedding from the cell surface constitutes an essential step in Hh transmission and high-threshold tissue patterning in vivo. 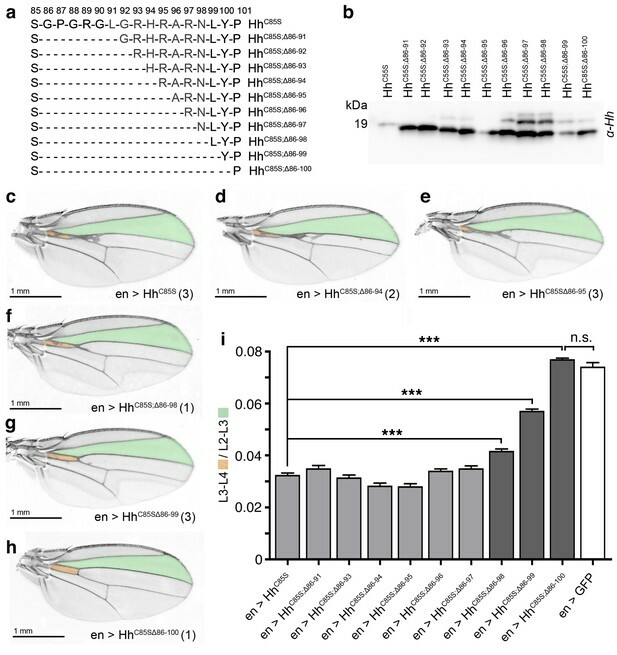 While we have used Drosophila wing development to elucidate this molecular process, we expect our results to also be relevant to other Hh-dependent developmental programs and to Hh ligand-dependent cancer induction and progression (Amakye et al., 2013). The following fly lines were used: Ptc-Gal4 (ptc>): w[*]; P(w[+mW.hs]=GawB)ptc[559.1], Bloomington stock #2017; En-Gal4e16E (En>): P(en2.4-GAL4)e16E, FlyBaseID FBrf0098595; Hh-Gal4 (hh>): w[*];; P(w[+mC]=Gal4)hh[Gal4], Bloomington stock #67046; en(2)-Gal4 (en(2)>): w1118;; P(GMR94D09-Gal4), Bloomington stock #48011; 34B-Gal4 (34B>): y1w[*];; P(w[+mW.hs]=GawB)34B, Bloomington stock #1967. These lines were crossed with flies homozygous for UAS-hh or variants thereof. All Hh cDNAs cloned into pUAST-attP were first expressed in Drosophila S2 cells to confirm correct protein processing and secretion. Transgenic flies were generated by using the landing site 51 C1 by BestGene or in-house by using strain PhiC31(X); attPVK37; attP2 that possesses the landing sites VK37 and attP2. Cassette exchange was mediated by germ-line-specific phiC31 integrase (Bateman et al., 2006). Ptc-LacZ reporter flies were kindly provided by Jianhang Jia, Markey Cancer Center, and Department of Molecular and Cellular Biochemistry, University of Kentucky College of Medicine, Lexington, USA. Wing discs were fixed, permeabilized and stained with anti-β-galactosidase antibodies (Cappel, MP Biomedicals) and Cy3-conjugated goat-α-rabbit antibodies (Jackson Immuno Research). Posterior, Hh-producing cells were detected with monoclonal antibodies directed against engrailed (en 4D9, DSHB) and Alexa488-conjugated donkey-α-mouse antibodies (Thermo Fisher). Images were taken on a LSM 700 Zeiss confocal microscope using ZEN software. Maximum intensity projections are shown. Hh cDNA (nucleotides 1–1416, corresponding to amino acids 1–471 of D. melanogaster Hh) and HhN cDNA (nucleotides 1–771, corresponding to amino acids 1–257) were inserted into pENTR, sequenced, and cloned into pUAST for protein expression in S2 cells or the generation of transgenic flies. Mutations were introduced by QuickChange Lightning site-directed mutagenesis (Stratagene). Primer sequences and sequence information is shown in Supplementary file 1. S2 cells (RRID: CVCL_Z232) were cultured in Schneider’s medium (Invitrogen) supplemented with 10% fetal calf serum (FCS) and 100 μg/ml penicillin/streptomycin. The cells were obtained from C. Klämbt, University of Münster, Germany, and tested negative for mycoplasma. S2 cells were transfected with constructs encoding Hh and HhN variants together with a vector encoding an actin-Gal4 driver by using Effectene (Qiagen) and cultured for 48 hr in Schneider’s medium before protein was harvested from the supernatant. Shh constructs were generated from murine cDNA (NM_009170) by PCR (primers are listed in Supplementary file 1). Hh acyltransferase cDNA (NM_018194) was obtained from ImaGenes and cloned into pIRES (ClonTech) for bicistronic Shh/Hh acyltransferase coexpression in the same transfected cells. This resulted in N-palmitoylated, C-cholesterylated proteins. Bosc23 cells (RRID: CVCL_4401) were cultured in Dulbecco's modified Eagle’s medium (Lonza) supplemented with 10% FCS and 100 µg/ml penicillin-streptomycin. The cells were obtained from D. Robbins, University of Miami, USA, authenticated via by PCR-single-locus-technology (Eurofins Forensics), and tested negative for mycoplasma. Bosc23 cells were transfected with PolyFect (Quiagen) and cultured for 48 hr, the medium was changed, and Shh was secreted into serum-free medium for the indicated times. All media were ultracentrifuged for 30 min at 125,000 g, and the proteins were TCA precipitated and analyzed by 15% SDS-PAGE and western blotting with polyvinylidene difluoride membranes. Blotted proteins were detected by α-HA antibodies (mouse IgG; Sigma), α-Shh antibodies (goat IgG; R and D Systems), or α-Hh (rabbit IgG, Santa Cruz Biotechnology). Incubation with peroxidase-conjugated donkey-α-goat/rabbit/mouse IgG (Dianova) was followed by chemiluminescent detection (Pierce). Photoshop was used to convert grayscale blots into merged RGB pictures for improved visualization of terminal peptide processing. Drosophila third-instar larvae were collected and transferred into a microcentrifuge to which 1 ml lysis buffer was added (PBS containing 1% (v/v) Triton X-100). Larvae were homogenized with a micropestle and the solution was cleared at 15,000 rpm for 15 min at 4°C. The supernatant was sterile-filtered (45 μm) and transferred into a fresh microcentrifuge tube for gel filtration analysis. All processings were conducted at 4°C. Gel filtration analysis was performed on an Äkta protein purifier (GE Healthcare) on a Superdex200 10/300 GL column (Pharmacia) equilibrated with PBS at 4°C. Eluted fractions were TCA precipitated and analyzed by SDS-PAGE as described earlier. Signals were quantified by using ImageJ. Sequence analysis was conducted on the CFSSP secondary structure prediction server (http://www.biogem.org/tool/chou-fasman/). All statistical analyses were performed in GraphPad Prism by using the Student’s t test (two-tailed, unpaired, confidence interval 95%). For wing quantifications, 10 male and 10 female wings were analyzed for each data set and ratios between L3-L4 intervein areas and L2-L3 intervein areas determined. All error estimates are standard errors of the mean (SEM). Shh-expressing Bosc23 cells were fixed overnight at 4°C in 4% paraformaldehyde/glutaraldehyde, washed in PIPES, and dehydrated in a graded ethanol series (30% EtOH, 4°C, 45 min; 50% EtOH, −20°C, 1 hr; 70% EtOH, −20°C, 1 hr; 90% EtOH, −20°C, 1.5 hr; 100% EtOH, −20°C, 1.5 hr; 100% EtOH, −20°C, 1.5 hr). Dehydrated cells were embedded in Lowicryl K4M embedding medium by using the Lowicryl K4M Polar Kit (Polysciences). Cells were then embedded in gelatin capsules, centrifuged twice for 15 min at 1500 rpm, and incubated overnight at −35°C. For polymerization, the resin was UV irradiated for 2 days at −35°C. The embedded samples were cut into 60 nm sections, washed in PBS containing 5% BSA (pH 7.4), and incubated for 2 hr in PBS-BSA containing primary antibodies (α-Shh antibodies from R and D, GeneTex, and Cell Signaling at 1:20 dilution). Samples were washed five times in PBS-BSA and once in Tris-BSA. Secondary antibodies conjugated to 5 nm and 10 nm gold nanoparticles were diluted in Tris-BSA buffer and incubated with the cell sections for 1 hr. Afterwards, samples were washed five times in Tris-BSA and once in dH2O. Contrasting was done with 2% uranyl acetate (15 min) and Reynold’s lead citrate (3 min). Finally, immunogold-labeled cell sections were analyzed by using a transmission electron microscope (CM10, Philips Electron Optics). The transgenic fly lines Hh-CW (lacking the putative N-terminal Hh processing site), Hh-CW/HA (a variant having this site replaced with a hemagglutinin tag) and HhHS (carrying a C-terminally inserted HA-tag) generated in the course of this study that support the phenotypes described in the manuscript are available upon request from the corresponding author (KG). We plan to publish these new lines separately in the future. Molecular and Cellular Biology 24:10397–10405. Princeton, NJ: Princeton University Press. Nature Structural & Molecular Biology 16:691–697. Journal of Biological Chemistry 286:44391–44402. Journal of Biological Chemistry 284:8013–8022. Journal of Biological Chemistry 281:4087–4093. Journal of Biological Chemistry 287:42881–42889. Journal of Cell Science 127:1726–1737. Sonic hedgehog multimerization: a self-organizing event driven by post-translational modifications? Journal of Biological Chemistry 285:26570–26580. Journal of Biological Chemistry 287:43708–43719. Journal of Cell Science 128:2374–2385. Journal of Biological Chemistry 273:14037–14045. Journal of Cell Science 112 (Pt 23):4405–4414. Thank you for submitting your work entitled "Proteolytic processing of palmitoylated Hedgehog peptides specifies the 3-4 intervein region of the Drosophila wing" for consideration by eLife. Your article has been reviewed by a Senior Editor and three reviewers, one of whom is a member of our Board of Reviewing Editors. Our decision has been reached after consultation between the reviewers. Based on these discussions and the individual reviews below, we regret to inform you that your work will not be considered further for publication in eLife. All the reviewers found the paper to be potentially interesting: it is well written and deals with an important topic. But after discussion the consensus view was that the conclusions are not yet well enough supported by the experimental data to justify publication in eLife. In addition to the need for the experiments described to be more rigorously performed, the proposed model makes several predictions that could be tested to provide further evidence. The reviewers were keen to point out that although eLife has a policy of rejecting papers where it is judged that more than 2 months will be needed for revisions, were this work to develop into a more mature story, there is no barrier to resubmitting it in the future. This is an interesting paper that uses a combination of microscopy, cell biology and Drosophila genetics to carefully dissect the mechanisms that underlie Hh release and intercellular trafficking. The aim is to resolve the mystery of how a dual lipidated extracellular protein, which oligomerizes and tightly associates with the cell surface of the producing cell, is nevertheless transported across an epithelial field of cells to act on cells at a distance. Several models have been proposed, including trafficking by exosomes or cytonemes, but the conclusion of this paper is that proteolytic shedding of the palmitoylated N-terminal of Hh is the key step. This is a thought-provoking and carefully designed set of experiments that lead to some plausible and generally well supported conclusions. It's also an important topic, being a central issue about the regulation of a primary signaling pathway of relevance to development and disease. In general, I think it is appropriate for a journal like eLife. It is, however, a complicated story, and one which still leaves quite a few questions: it will not be the last word on this topic. Although the experiments are well planned and quite elegant, I found some are hard to follow. I'd suggest more use of diagrams to outline the logic of individual experiments. An example would be the use of Ptc>HhC85S to discriminate between autonomous and non-autonomous effects. People not used to fly developmental biology will find this difficult. Another case would be the Bosc23 cells expressing the differently tagged versions. The tone of many of the results is quite definitive and I am not sure this is wholly justified. The results are clear and the interpretations plausible, but I am not convinced that in each case their interpretation is the only way of interpreting the data. The paper would be stronger if the current results were more clearly set in the context of other models, with more discussion about how these results challenge or support different views. Since there are already quite well discussed models of Hh trafficking, the current authors need to leave the reader with as clear as possible a view of what this new paper changes and what are the still outstanding questions. One gap I detected was any discussion about the C-terminal cleavage. If I understand their model correctly, this is also essential for release of active Hh. Is the view that the clustering is also necessary for that? And do they envisage that the N- and C-terminal cleavages are done by the same or different proteases? Moreover, what is known about the identity of the proteases should also be discussed. The maturation of Sonic Hedgehog (Shh) is very atypical as the final mature protein is dually lipid modified, by an N-term palmitic acid and a covalent link with a molecule of cholesterol on the C-terminus. How it is extracted from the plasma membrane bilayer and is transported to long-range targets is still enigmatic. 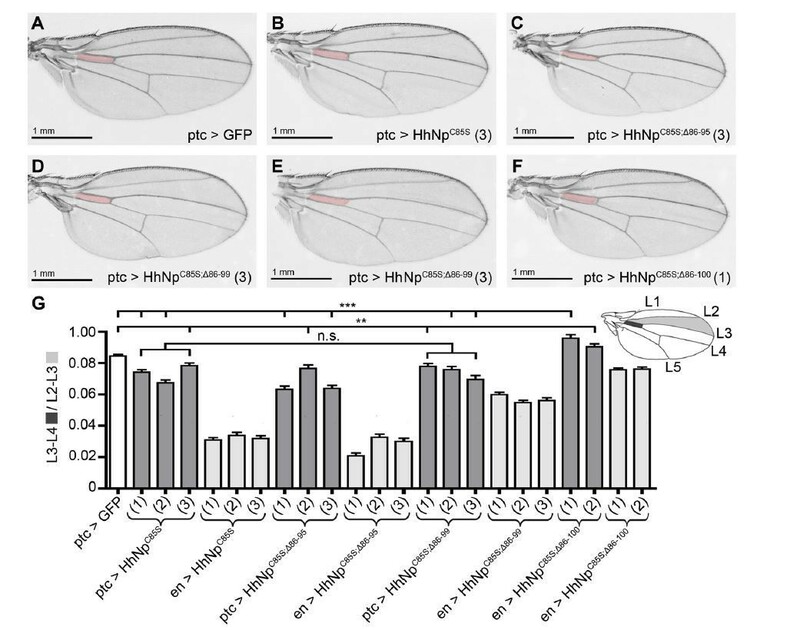 Overexpression of the non-palmitoyled HH variant in wild type HH producing cells of the Drosophila wing discs reveals a dominant negative activity on the final adult wing pattern. The overexpression of this variant in HH receiving cells had only a weak effect. From this difference the authors came to the conclusion that the non-palmitoyled HH variant display a dominant negative effect only when expressed in the same cells with the wild type protein and forming a mixed cluster. This is the basis of the model but I believe several other hypothesis can be proposed (in addition, the fact that not HH target genes are presented in this study weaken the entire picture). For example, the authors do not show that the two drivers express the HH variant at the same level which could explain a differential dominant negative effect. It is also possible that upon forced expression of HH in anterior cells, the protein is not secreted at the correct pole (apical/basal) of the cell and thus cannot bind properly to its receptor. No staining of extracellular HH is provided here. Conventional and extracellular staining of the different HH variants is imperative to get a clearer picture of the behavior of these variants in vivo. One should note that overexpression of this variant has been published previously by several other groups in 2006 and showed an opposite result, with expansion of target genes in both embryos and wing imaginal discs. This is not commented by the authors. 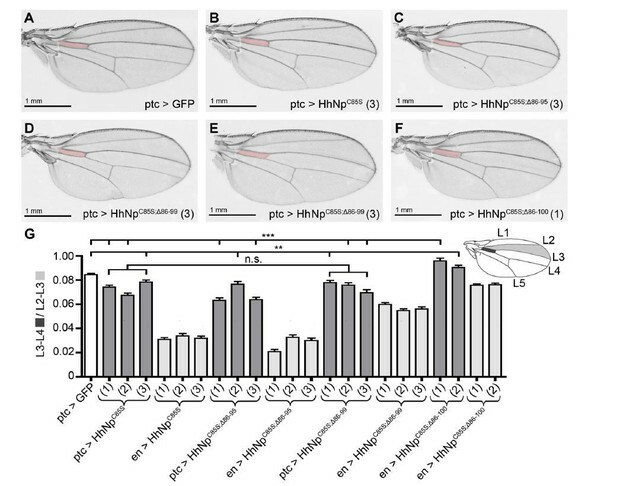 The authors showed that N-terminal truncation of HH reversed the dominant negative activity of the non-palmitoyled HH variant when expressed in flies. These new variants are not forming multimere but monomere. From this, the authors proposed that the inhibitory effect of unprocessed N-terminal peptides is linked to its presence in the multimere. But it is also possible that these new variants cannot bind properly Hh receptor and thus are just "neutral" with no activity whereas the non-palmitoyled variant binds the receptor but do not activate signaling properly. There are numerous in vitro assays that could be performed to test the author's hypothesis, for example, why not analyze binding affinity of HH variants to Ptc with synthesized peptides? Altogether, the authors propose a model in which Hh is secreted to the plasma membrane as dually lipidated molecule, assembled as multimer at the cell surface, and then cleaved for propagation. What is surprising with the author's model is that both lipids need to be cleaved to release Hh functional cluster from producing cells. This is intriguing as numerous labs have shown that expression of a HH variant without lipid is secreted as monomere with no activity. So, the authors would need to resolve two important questions to confirm their model. First, how the cleaved HH molecule is kept assembled as multimer, and second, how the putative multimer of non-lipidated HH proposed here is able to provide signaling activation when a monomeric non-lipidated HH cannot. In conclusion, I did not find that the new data provide convincing data and progress for a firm evidence of the model proposed here. I also advise this team to take into more consideration many of the in vivo data already published by other labs, which in several cases appears to be contradictory to the author's own observation. 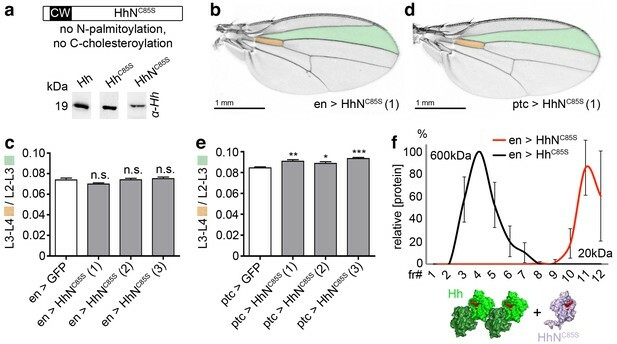 The manuscript by Grobe and colleagues use the Drosophila wing as the principal model system to analyse the functional role of protein palmitoylation in the N-terminal cysteine of Hedgehog (Hh) signalling molecule. Authors present evidence that mutant forms of Drosophila Hh unable to be palmitoylated (Hh-C85S) or proteolytically processed (HA-Hh) gives rise to a Hh-loss of function adult wing phenotype when overexpressed in Hh-expressing but not responding cells, and that truncation of the N-terminal region of Hh-C85S or a mutation of the N-terminal cysteine in HA-Hh restore these phenotypes. Authors propose that palmitoylation of Hh contributes to the clustering of Hh molecules at the cell membrane of Hh-expressing cells and to the tightly controlled-proteolytic processing and release of an active form of Hh able to bind to Ptc in nearby cells. The paper is excellently written and the proposed working model is consistent with the results. Authors have done an excellent and thorough exercise by using the Drosophila wing together with EM data and cell culture experiments and propose a mechanistic model of the biological function of Hh-palmitoylation. Authors conclude that the adult wing phenotype caused by expression of Hh-C85S or HA-Hh in the P compartment is caused by a dominant negative effect on the endogenous Hh molecule (as nicely depicted in their cartoons). Authors should present evidence (1) that the wing phenotype can be rescued by co-expression of a wild type form of Hh, (2) that release of a wild type form of Hh into the adjacent compartment is compromised by Hh-C85S or HA-Hh co-expression (by using available UAS-Hh-GFP transgenic flies), and (3) that anterior cells abutting the P compartment are still sensing Hh signalling (similarly to a tethered form of Hh). Thus, expression of a wild type form of Hh and Hh target genes should be analysed in wing primordia of all genotypes (en-gal4; UAS-Hh-C85S +/- UAS-Hh-GFP and en-gal4; UAS-Hh-A +/- UAS-Hh-GFP) to confirm their proposal. These experiments are feasible. 1) Were male of female wings used in their L3-L4/L2-L3 region measurements? 2) Authors should notice that en-gal4 is also expressed in the A compartment, although at lower levels and later in development. The ability of Hh-C85S and HA-Hh to cause a wing phenotype should be analysed also with the hh-gal4 driver (again available in the fly community). 3) Expression of Hh-C85S in the ptc domain has not phenotype (Figure 3H) while Hh-HA does Figure 6H, I). Why? 4) How certain are authors that veins in Figure 6B are L4 and L5 and not L2 and L5. The latter would be expected as these are the ones that depend on Dpp signalling. Thank you for resubmitting your work entitled "Proteolytic processing of palmitoylated Hedgehog peptides specifies the 3-4 intervein region of the Drosophila wing" for further consideration at eLife. Your revised article has been favorably evaluated by Naama Barkai (Senior Editor), a Reviewing Editor, and three reviewers. The manuscript has been improved but there are some remaining issues that need to be addressed before acceptance, as outlined below. The editors and reviewers have discussed your paper extensively. Our position is that your work is interesting, provocative and of potential broad significance. On the other hand, there is a clear consensus that you do not currently provide a clear enough description of the controversy and uncertainty that surrounds your interpretation. Your paper does not yet allow a definitive conclusion about the model. eLife is an appropriate journal for this kind of work, but only if the authors are able clearly and explicitly to describe their work in the wider context, allowing a reader to form a balanced picture of where the field stands. We would therefore like to give you one more opportunity to respond to remaining concerns but also – and even more importantly – to rewrite the Introduction and Discussion in a way that gives that broader context and describes to a non-expert reader the uncertainties that remain about your model. What would be a definitive experiment that might prove or refute it? Which areas are you least confident about? Do you have a plan about how to address them? How do you reconcile your ideas with previous apparently contradictory data? Science is full of uncertainty and journals like eLife should not encourage this to be hidden behind unrealistic confidence or advocacy. If you can amend your paper to provide a fair and balanced description of how the field stands, and how your new data move it forward, but also where the uncertainties still lie, we would be happy to publish it. If you feel that this is not in your best interest and you prefer to argue for your model more directly, our decision would be not to accept it. In addition to these general points there are still some remaining specific issues in the reviews below. We would encourage you to address these as fully as possible. Where necessary and appropriate, please acknowledge if they provide significant challenges to your model. As it is the second time I review this work, I will directly follow the main comments I have put together for the first manuscript. The authors made some effort (by providing target gene expression) to answer this first comment. Nevertheless, there are numerous examples in the literature showing that expression of the non-palmitoyled HH variant in the anterior cells of the wing disc leads to a strong dominant negative effect (see for example, Figure D in Lee et al., 2001, Treissman lab). In the same paper, the authors mentioned that overexpression of the non-palmitoyled SHH variant in the posterior region of the mouse limb have no inhibitory effect on endogenous Shh activity, which contradict the model proposed here. So, the first proposal presented here, that, in producing cells, non-palmitoyled HH proteins associate in cluster with other HH protein in order to act as a dominant negative variant does not fit with published data. In addition, if this model was correct, one would expect a stoichiometric dominant negative effect of the non-palmitoyled HH variant, which again is not supported by the study of Williams et al., 1999. Also, I still do not understand the model based on a "model linear Drosophila Hh cluster", which I assume is based on the published crystallographic structure of vertebrate Shh. Surprisingly, a non-palmitoyled SHH does not form multimers, whereas a non-palmitoyled Drosophila HH does so (Figure 7 in Chen et al., 2004, Pao-Tien Chuang lab). So it is not clear to me how one can use information from Shh and extrapolate to Hh behavior, knowing that these two proteins behave differently. My previous comments: "No staining of extracellular HH is provided here. Conventional and extracellular staining of the different HH variants is imperative to get a clearer picture of the behavior of these variants in vivo." I still believe that, a non-detergent staining at 4 °C with Hh and/or HA antibodies will provide information such as: are these Hh variants accumulating at the cell surface of producing cells, how do they distribute in anterior cells compared to wt Hh etc.? There are also tricks (with for example the expression of a Ptc variant which is not internalized) to increase and visualize accumulation of Hh at the cell surface of receiving cells. As previous studies demonstrated that Ptc-binding restricts Hh spreading, one would expect that HhC25S-containing Hh multimers would spread more anteriorly because they bind Ptc less well compared with wild type Hh as suggested by the present model. Also, there are Hh variants presented in this study which are likely not binding to Ptc, such as the HHC85S;delta86-100. Indeed, a deletion of the first 20 NH2 terminal residues of SHH leads to a protein that do not bind to Ptc anymore (Williams et al., 1999). Well, both studies described in Gallet et al., 2003 (Figure 2) and Callejo et al., 2006 (Figure 6) showed that embryonic wg, and larval dpp and iro expressions are expanded under overexpression of HhC85S. Another issue which needs clarification regards the putative multimer of non-lipidated HH which is proposed in the model here (Figure 5A). How is this multimer able to provide signaling activation whereas a monomeric non-lipidated HH cannot? And how the Hh proteins is kept assembled in the multimer without lipids? This is difficult to understand for me. The authors might be right but their model of cell-surface shedding relies mainly on in vitro experiment in which Shh is expressed at a non-physiological level in cultured cells. So far, if I am correct, in all their "Hh shedding" studies, the authors used the human kidney cell line HEK293 and its derivative the Bosc23 cell line, which is a model for cancer research and which might not mimic physiological conditions. Interestingly, the acyl transferase that catalyzes the transfer of a palmitoyl moiety to Hh has been identified in flies. When its homolog is mutated in mice (Chen et al., 2004), digit 3 to 5 (which depends on long range activity of Shh) still form, suggesting that, if Shh assembles in multimere in this mutant, the non-palmitoyled SHH is still able to bind Ptc and activate the pathway. How do the authors reconcile their data with this observation? Furthermore, a wide variety of hydrophobic modifications have been shown to increase the potency of Shh when added at the N-terminus of the protein, ranging from long-chain fatty acids to hydrophobic amino acids (Taylor et al., 2001). I do not see how this fits with the authors model. Overall, this is a story that is ultimately still not convincing for this reviewer. The model proposed here cannot explain many of the in vivo observations obtained by other labs, some of which are listed above. Schuermann et al. provide evidence that Hh activity and spread depend on the proteolytic removal of the palmitoylated N-terminal peptide. The paper contains a huge amount of data but there is no "killer experiment" that definitively proves the proposed model. For example, most of the conclusions rest on the use of ectopic expression of mutant versions in a wild-type background instead of replacement of the endogenous hh gene. Moreover, no in vivo localization data is provided. I therefore encourage the authors to raise the possibility that there might be other interpretations of the data and discuss the need for follow up studies of Hh versions expressed from the endogenous locus and visualized in vivo. Despite these concerns, the findings are interesting, provocative and of broad interest. 1) Is the packing seen in Figure 1 really due to Hh or could it be caused by the confirmation and size of the antibodies? 2) The evidence that the mutant versions are expressed at similar levels as wild-type Hh is sparse. 3) The authors try to build models on complex regulatory loops (e.g. ptc feedback in Figure 2) but the outcomes of such loops are very difficult to predict. 4) Subsection “N-palmitate controls Hh release from the cell surface in vitro”, last paragraph: "compelled"? Authors have successfully addressed all my concerns, so I believe the manuscript is ready for eLife. To improve the manuscript according to this suggestion, illustrations of results or schematics of Hh variants have been added: Figure 2 now shows wing disc stainings for engrailed (expressed in the Hh-producing posterior compartment) and the non-overlapping (anterior) ptc-expression domain to illustrate spatially connected / disconnected transgene expression. Figure 3 is added to the manuscript to confirm that Hh co-clustering constitutes the basis for dominant-negative activity of non-palmitoylated Hh (this is also illustrated). Finally, Figure 6 now contains schematics of the various Hh variants used including their detected cleavage sites. We agree with this reviewer that our conclusions sound strong, and we now toned them down and provided additional background, as requested. However, we suggest some words of caution should remain stated in the manuscript, especially that the cloning protocol for generating tagged, membrane tethered Hh-GFP from endosomes/exosomes/cytonemes (1-6) exactly matches a protocol to generate permanent GFP membrane markers (no Hh involved!) for the fluorescence microscopic visualization of cell membranes (7). This fact is important for the correct interpretation of published models that mostly derive from the microscopic analysis of Hh-GFP subcellular localization. In addition to that, data from our lab indicates (please refer to our responses to concerns raised by reviewer 2,) that Hh-GFP used in the above publications undergo almost quantitative proteolytic processing in L3 discs in vivo. This proteolytic processing results in a major fraction of cholesteroylated GFP and free (bioactive) Hh. This adds another critical problem to the above models: while the subcellular route of (irreversibly membrane tethered and non-physiological) GFP was followed by fluorescence microscopy, released Hh may have taken an entirely different route that escaped visualization. Moreover, we observed that HhC85S-GFP does not behave like untagged HhC85S in vivo, indicating additional problems associated with the tag. Despite these observations, which make us now even more sceptical of models derived from the study of Hh-GFP, and which make it hard for us to draw a useful and honest connection between these models and our data, we added a paragraph on the relevance of our results for these models (Discussion section). Finally, we would like to state that additional ongoing studies of flies carrying various deletions, mutations and insertions into the N-terminal Hh target site all recapitulate the data shown in this manuscript, and that electron microscopic analysis detected Hh clusters not associated with the cell membrane in fly wing discs in vivo, indicating their solubilisation. These data can be provided upon request. We indeed also study flies carrying deletions, insertions and mutations in the C- terminal Hh stem region (Four independent constructs, plus Hh-GFP used and published by others as mentioned above). In most cases, these mutations abolish all or most Hh bioactivity in vivo, as expected. This is consistent with published data demonstrating that non-steroylated Hh is present and highly active in vitro and in vivo (8). 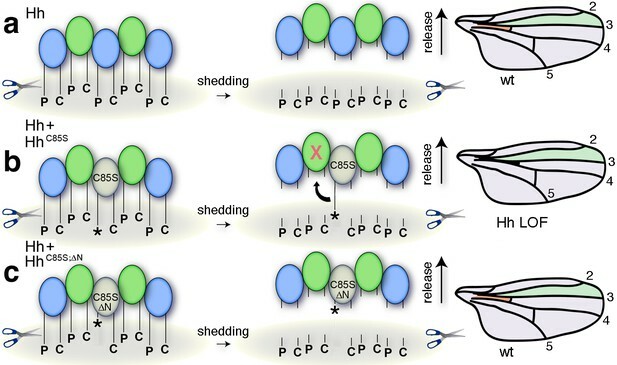 We also have indications that N- and C-terminal cleavages depend on different proteases, and (based on inhibitor studies) that Furin or related proteases target the N-terminal polybasic Hh Cardin-Weintraub-motif. These studies are all in progress, and we therefore ask that none of the preliminary data are to be included into the current manuscript. […] This is the basis of the model but I believe several other hypothesis can be proposed (in addition, the fact that not HH target genes are presented in this study weaken the entire picture). In the revised manuscript, we provide en, ptc and dpp target gene expression for palmitoylated and non-palmitoylated Hh variants that is consistent with observed wing phenotypes (Figures 8 and 10) and the mechanism that we propose. Dominant-negative HAHh eliminates (almost) all anterior Hh-regulated en- and ptc-expression, as suggested by wing phenotypes lacking all L3/L4 intervein tissue, while HAHhC85S represses target gene expression much less, if compared to HAHh and wild-type discs. This is consistent with the model that HAHh prevents the release of associated Hh from the producing cell surface. Moreover, we now also provide rescue data to confirm our model (please see comments to reviewer 3). From this difference the authors came to the conclusion that the non-palmitoyled HH variant display a dominant negative effect only when expressed in the same cells with the wild type protein and forming a mixed cluster […] I believe several other hypothesis can be proposed […] For example, the authors do not show that the two drivers express the HH variant at the same level which could explain a differential dominant negative effect. First, in our first set of experiments, only one (the same) driver line is used for different Hh variants (cell-tethered versus soluble Hh (Figure 3), non-truncated versus N- truncated Hh (Figure 4). The reviewer’s criticism thus does not apply to these experiments. In our second set of experiments, we indeed changed the expression domain for a given Hh variant (from posterior (en>) to a stripe in the anterior region (Ptc>)). Therefore, to address this reviewers concern, we co-expressed both, active Hh and dominant negative HAHh and HAHhC85S, in the same compartment (using only one driver for the simultaneous expression of both constructs). As also described in the reply to reviewer 3, these experiments confirmed our model: Dominant negative HAHhC85S activities under en-control were rescued by Hh co-expression (because more wt protein was now present in mixed clusters, increasing their activity), yet HAHh dominant negative activities could not be rescued (more Hh was expressed, and relative numbers of membrane tethers of any given cluster reduced, but remaining tethers still prevented release). Along the same line, using the 34B-Gal4 driver for targeted Hh expression in anterior cells, Hh gain-of-function (as indicated by a Moonrat-like phenotype (9)) was fully reversed by HAHh co-expression (by preventing Hh release). Both experiments (Figure 9 in the revised manuscript) make clear that different driver activities are not the cause for the observed wing phenotypes. It is also possible that upon forced expression of HH in anterior cells, the protein is not secreted at the correct pole (apical/basal) of the cell and thus cannot bind properly to its receptor. The hhMoonrat allele causes ectopic expression of the hh gene in the anterior wing compartment, where normally hh is not expressed (9). The resulting phenotype varies between clear overgrowth of the (usually distal) part of the wing to slight disorganization of the wing margin and the addition of extra vein material. 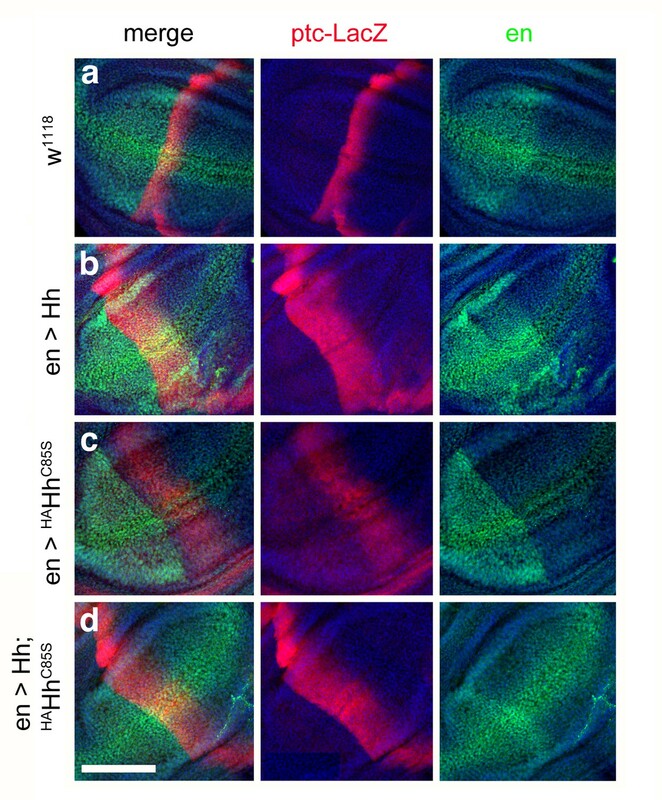 The HhMoonrat phenotype demonstrates that bioactive Hh is produced by anterior cells, and 34B-Gal4 driven expression of UAS-Hh in the anterior field (as described above and now shown in the revised manuscript, Figure 9, leading to the same phenotype) confirms this. We can thus not confirm any unspecific effect of anterior Hh expression. No staining of extracellular HH is provided here. Conventional and extracellular staining of the different HH variants is imperative to get a clearer picture of the behavior of these variants in vivo. As has been pointed out by Art Landers group in Irvine, reliable fluorescence microscopic visualization of free extracellular protein transport is close to impossible: Using Dpp as an example, it was estimated that free extracellular protein is unlikely to account for more than 3% of total morphogen, and less than 1% of what is normally visualized by fluorescence imaging (10). Most of the material that could be visualized is either receptor/surface-associated or internalized. This fact rules out the use of fluorescence microscopy to visualize released Hh. We also decided against visualization of GFP-tagged forms of Hh, because 1) the freely diffusible fraction cannot be visualized, as outlined above, but only the immobile fraction. 2) In our hands, GFP-tagged Hh and HhC85S show extensive proteolytic processing and HhC85S-GFP acts unlike untagged HhC85S in vivo. For all of these reasons, we refrained from trying to visualize extracellular Hh in vivo by fluorescence microscopy, and decided to use clear unambiguous genetic assays instead. However, in another project, conventional immuno-electron microscopy of Drosophila wing discs was performed that allowed for the specific discrimination between membrane-associated Hh (expressed under en-Gal4 control, large clustered groups, red/white arrowheads) and extracellular yet matrix-associated Hh. The in vivo detection of matrix-associated extracellular protein distant from membranes strongly supports Hh release via shedding, and also support data of others (8). The figure is planned to be part of another manuscript; it is therefore not included in this submission. One should note that overexpression of this variant has been published previously by several other groups in 2006 and showed an opposite result, with expansion of target genes in both embryos and wing imaginal discs. This is not commented by the authors. We wonder which papers and which variant the reviewer does refer to. If it is HhC85S, we are not aware of any publication claiming that this form has any bioactivity; the general consensus is that non-palmitoylated invertebrate Hh is always completely inactive. If the reviewer refers to non-palmitoylated yet (variably) bioactive Sonic Hh in vertebrates, we would like to refer to our recently published work on this topic (11). Here, bioactivation of unpalmitoylated Shh is caused by Scube2-assisted N-terminal shedding, which for the first time explains the important yet variable role of N-palmitate for (vertebrate) Hh activity. The authors showed that N-terminal truncation of HH reversed the dominant negative activity of the non-palmitoyled HH variant when expressed in flies. These new variants are not forming multimere but monomere. This must be a misunderstanding. As shown in Figure 4—figure supplement 2 and Figure 6—figure supplement 1, all cholesteroylated Hh variants used in this study multimerize. From this, the authors proposed that the inhibitory effect of unprocessed N-terminal peptides is linked to its presence in the multimere. But it is also possible that these new variants cannot bind properly Hh receptor and thus are just "neutral" with no activity whereas the non-palmitoyled variant binds the receptor but do not activate signaling properly. There are numerous in vitro assays that could be performed to test the author's hypothesis, for example, why not analyze binding affinity of HH variants to Ptc with synthesized peptides? If we understand the comment correctly, the reviewer refers to the possibility of differential receptor binding/activation N-palmitoylated and non-palmitoylated Hh. However, we would like to point out that the design of all experiments shown in our submitted study is to assay the biofunction of the endogenous protein that is only indirectly affected by our transgenic forms without intrinsic activity – receptor binding of endogenous Hh, and not of our mutants, is therefore our read-out. The possibility of differential receptor binding/activation thus does not apply here. In our re-submitted manuscript, we extend these experiments to using bioactive transgenic Hh together with various palmitoylated and non-palmitoylated recombinant proteins expressed from posterior and ectopic anterior cells – again, this does not affect receiving cells, as it is always the endogenous / recombinant bioactive Hh that is assayed. The possibility of non-productive “blockade” of receptors is also not the case, as shown by ptc>HhC85S expression shown in our work: Here, wing patterning is still unaffected. This is described in the original and resubmitted manuscript (Figures 2 and 3, and Author response image 2). In contrast, impaired Hh binding to its receptor Ptc by unprocessed N-terminal peptides has extensively been demonstrated in the past (12-16), and has recently been confirmed by showing that proteolytic processing effectively truncates and activates non- palmitoylated inactive Sonic Hh (Author response image 1) (11). Palmitate or the N-peptide, therefore, are not directly required for signalling – palmitate merely controls that Sonic Hh clusters are completely N-processed during their release. N-terminal Shh processing activates Shh. Center: Intermolecular interactions observed in the human Shh crystal structure (pdb:3M1N) (17). Analysis of crystal symmetry mates revealed that N-terminal peptides (amino-terminal amino acids 25-45, blue) wrap around the symmetry-related molecule (green) and interact with its zinc-coordination site, which is the Ptc receptor binding site. Zinc is shown as a black sphere, the yellow surface marks the Ptc-receptor binding site, and the putative sheddase target site (called CW motif) is marked in red. Proteolytic processing during release truncates the protein (bottom) and increases its electrophoretic mobility (left). To better demonstrate N-terminal Shh processing during release, we inverted and colored (gray) the scale blots obtained from α-Shh antibody (binds processed and unprocessed Shh) and α-CW antibody (binds the putative cleavage site) incubation. Yellow signals in merged blots thus denote N-unprocessed proteins bound by both antibodies, and green signals confirm the removal of N- terminal peptides (arrow). Complete processing of N-palmitoylated N-termini (Shh) and incomplete processing of non-palmitoylated termini (ShhC25A) is confirmed by differential α-CW-antibody binding. Right: Protein processing converts otherwise inactive ShhC25A into the active morphogen, as indicated by induced Hh-dependent C3H10T1/2 reporter cell differentiation into osteoblasts. *** denotes statistical significance (p<0.0001), **denotes statistical significance (p<0.0047). n.s. : not significant (<0.05). Taken from (11). Finally, peptides cannot mimic the extended conformational Hh binding site, and as has been outlined in our earlier work (14), N-peptides are only loosely associated with the Ptc-binding site of adjacent molecules, so cleavage will efficiently remove them. The suggested experimental approach is therefore not usable, also because authentic multimeric Hh is required for the suggested tests that has never been produced and purified in sufficient amounts. We note that there is no contradiction: published studies that the reviewer refers to describe HhNC85S that had never been lipidated, as it lacked the C-terminal autoprocessing/cholesterol transferase domain and the palmitate acceptor cysteine. Such proteins are directly secreted in monomeric (inactive) form, like our protein now shown in Figure 3 of the resubmitted manuscript. Lipidated Hh proteins, in contrast, first associate with the cell surface as a prerequisite to form large multimeric complexes (18), and only then can get proteolytically processed and activated (See Author response image 1). Thus, only Hh produced in lipidated form generates multimers, and proteolytic truncation makes the Ptc-binding site available. This has been published (12-14). Continued association of soluble clusters are best explained by the very large protein/protein interface of about 1000 Angström2 (14). The second question implies that the “putative” multimer (actually, it is firmly established that lipidated Hh multimerizes) cannot provide signalling activation, if the monomer cannot. The explanation is given above: Monomeric HhNC85S had never been lipidated, is soluble, and secreted without processing. Multimeric Hh had been dual- lipidated and – due to removal of inhibitory N-peptides, see above – becomes activated during release. The mechanism is described in detail in published papers and summarized under answer #7. We thank this reviewer for the very useful suggestion to conduct rescue experiments. The obtained results support our model, and are thus included in the re-submitted manuscript (Figures 9-10). 1) We now show that, under en-control, HAHhC85S-induced wing mispatterning is rescued by transgenic Hh. These experiments confirm that “diluting” inhibitory peptides (by increasing relative amounts of Hh) compensates for the C85S mutation. In notable contrast, en>HAHh leads to pharate lethality, and Hh co-expression did not rescue this phenotype (only very few flies hatched, these showed severe wing mispatterning). This is because HAHh (even if “diluted”) still retains associated Hh at the surface of producing cells, confirming our model. 2) To show that release of a wild type form of Hh into the adjacent compartment is compromised by HAHhC85S or HAHh co-expression, we performed the same rescue experiment in the absence of any endogenous Hh expression in the anterior compartment. It is well-established that anterior Hh misexpression (caused by a natural mutation called moonrat) causes anterior wing overgrowth. Forced Hh expression in anterior cells under 34B-Gal4 control results in the same phenotype. The expression of inactive HhC85S and HAHh alone do not cause moonrat phenotypes, as expected. However, 34B>Hh induced anterior wing overgrowth is completely reversed by HAHh (again by retaining Hh at the surface of producing cells), but HhC85S merely reduced the moonrat gain-of-function phenotype (by incomplete blockade of Hh Ptc-binding sites). 3) En/ptc/dpp target gene expression at the A/P border is consistent with the obtained phenotypes. 10 male and 10 female (single) wings were analyzed per data set. This is now stated in the Materials and methods section. No differences in wing patterning were observed between the sexes. Hh-Gal4 (Bloomington #67046, FlyBaseID FBti0017278) fully reproduced our results, as now shown in Supplement 4. Another en-line (Bloomington #48011) also reproduces our observed phenotypes. Data are now included (Figure 4—figure supplement 5). As stated, the intervein area was about 7% smaller upon ptc- mediated HhC85S expression, so a small effect was present. Stronger phenotypes were observed for some truncated C85S constructs (see Author response image 2). One idea to explain this is that transgenic proteins may saturate Heparan sulfate binding sites in the anterior field, in turn somehow reducing transport or activity of endogenous Hh. Compared phenotypes resulting from the overexpression of HhC85S and N- terminally truncated variants in the Hh-producing and Hh-receiving compartments of the wing disc. (A-F) Adult wing structures as a result of ptc-Gal4-mediated overexpression of non- palmitoylated Hh in wild type background (at 25 °C). Note that proximal L3-L4 intervein spaces get slightly reduced (B-D) and, in addition, varying numbers of wings lacked the ACV (E and Table 1 below). Wing patterning is fully restored upon deletion of the most N-terminal 15 amino acids. We agree with this reviewer that veins shown in this figure cannot be clearly assigned. This has been changed in the revised MS.
1. D'Angelo G, Matusek T, Pizette S, Therond PP. Endocytosis of Hedgehog through dispatched regulates long-range signaling. Dev Cell. 2015;32(3):290-303. 2. Torroja C, Gorfinkiel N, Guerrero I. Patched controls the Hedgehog gradient by endocytosis in a dynamin-dependent manner, but this internalization does not play a major role in signal transduction. Development. 2004;131(10):2395-408. 3. Callejo A, Culi J, Guerrero I. Patched, the receptor of Hedgehog, is a lipoprotein receptor. Proc Natl Acad Sci U S A. 2008;105(3):912-7. 4. Callejo A, Bilioni A, Mollica E, Gorfinkiel N, Andres G, Ibanez C, et al. Dispatched mediates Hedgehog basolateral release to form the long-range morphogenetic gradient in the Drosophila wing disk epithelium. Proc Natl Acad Sci U S A. 2011;108(31):12591-8. 5. Bischoff M, Gradilla AC, Seijo I, Andres G, Rodriguez-Navas C, Gonzalez-Mendez L, et al. Cytonemes are required for the establishment of a normal Hedgehog morphogen gradient in Drosophila epithelia. Nat Cell Biol. 2013;15(11):1269-81. 6. Gradilla AC, Gonzalez E, Seijo I, Andres G, Bischoff M, Gonzalez-Mendez L, et al. Exosomes as Hedgehog carriers in cytoneme-mediated transport and secretion. Nat Commun. 2014;5:5649. 7. Vincent S, Thomas A, Brasher B, Benson JD. Targeting of proteins to membranes through hedgehog auto-processing. Nat Biotechnol. 2003;21(8):936-40.
hedgehog in flies and mammals. PLoS Biol. 2013;11(3):e1001505. 9. Haines N, van den Heuvel M. A directed mutagenesis screen in Drosophila melanogaster reveals new mutants that influence hedgehog signaling. Genetics. 2000;156(4):1777-85. 10. Zhou S, Lo WC, Suhalim JL, Digman MA, Gratton E, Nie Q, et al. Free extracellular diffusion creates the Dpp morphogen gradient of the Drosophila wing disc. Curr Biol. 2012;22(8):668-75. 11. Jakobs P, Schulz P, Schurmann S, Niland S, Exner S, Rebollido-Rios R, et al. Calcium coordination controls sonic hedgehog structure and Scube2-cubulin domain regulated release. J Cell Sci. 2017. 12. Jakobs P, Schulz P, Ortmann C, Schurmann S, Exner S, Rebollido-Rios R, et al. Bridging the gap: heparan sulfate and Scube2 assemble Sonic hedgehog release complexes at the surface of producing cells. Sci Rep. 2016;6:26435. 13. Jakobs P, Exner S, Schurmann S, Pickhinke U, Bandari S, Ortmann C, et al. Scube2 enhances proteolytic Shh processing from the surface of Shh-producing cells. J Cell Sci. 2014;127(Pt 8):1726-37. 14. Ohlig S, Farshi P, Pickhinke U, van den Boom J, Hoing S, Jakuschev S, et al. Sonic hedgehog shedding results in functional activation of the solubilized protein. Dev Cell. 2011;20(6):764-74. 15. Ohlig S, Pickhinke U, Sirko S, Bandari S, Hoffmann D, Dreier R, et al. An emerging role of sonic hedgehog shedding as a modulator of heparan sulfate interactions. J Biol Chem. 2012;287(52):43708-19. 16. Dierker T, Dreier R, Migone M, Hamer S, Grobe K. Heparan sulfate and transglutaminase activity are required for the formation of covalently cross-linked hedgehog oligomers. J Biol Chem. 2009;284(47):32562-71. 17. Pepinsky RB, Rayhorn P, Day ES, Dergay A, Williams KP, Galdes A, et al. Mapping sonic hedgehog-receptor interactions by steric interference. J Biol Chem. 2000;275(15):10995-1001. 18. Vyas N, Goswami D, Manonmani A, Sharma P, Ranganath HA, VijayRaghavan K, et al. Nanoscale organization of hedgehog is essential for long-range signaling. Cell. 2008;133(7):1214-27. We are grateful for the opportunity to revise our manuscript “Proteolytic processing of palmitoylated Hedgehog peptides specifies the 3-4 intervein region of the Drosophila wing” according to your suggestions and the final points raised by the reviewers. Following the line of a recently published paper in eLife, “Cytoneme-mediated cell-cell contacts for Hedgehog reception” by Gonzales-Mendez et al., we agree that our findings can – and should – be related to previous findings on Hh morphogen release and transport to provide a more balanced view of where the field currently stands. We also added a balanced view on the strengths and weaknesses of our concept and of ways to test them. Specifically, we changed the following parts of our manuscript and marked all changes in red in the related manuscript version called “Schuermann et al. marked changes”. 1) In the Discussion section, we added a paragraph describing the strengths and weaknesses of our concept of proteolytic Hh release, and we suggest experiments required to support our concept in other tissues. The greatest uncertainty we see in our concept is that N-truncation of non-palmitoylated HhC85S rescues wild-type Hh activity in the wing disc, but does not lead to a gain-of-function (in contrast to the situation in cell culture, as described below). A possible experiment to test this problem is now discussed and (after we had been planning this long before) will be started in the lab. 2) We also discuss potential congruencies between our concept of proteolytic Hh release and activation and the concepts of others, specifically, the possibility that Hh shedding relays Hh at the cytoneme synapse. To this end, we added Figure 12 to illustrate and describe the various concepts of membrane-dependent and -independent Hh transport. 3) We reworded the Introduction and Discussion to make our results and conclusions less definitive, as requested by the editors. […] Overall, this is a story that is ultimately still not convincing for this reviewer. The model proposed here cannot explain many of the in vivo observations obtained by other labs, some of which are listed above. Reviewer 1 stated that a paper by Lee et al. (2001) demonstrates that non-palmitoylated Shh variants expressed in the posterior region of the mouse limb have no inhibitory effect on Hh patterning. We were aware of this finding and the fact that ectopic overexpression of non-palmitoylated Shh in the mouse even induces significant gain-of-function phenotypes (Chen et al., 2004; Kohtz et al., 2001; Lee et al., 2001) and that loss of palmitoylase activity in Hhat mutants causes defects that are characteristic of defective Shh signaling, but are less severe than Shh loss-of-function phenotypes (Chen et al., 2004). However, we believe that our model of coupled N-terminal Hh processing and activation does not contradict these data, as claimed by the reviewer, but rather explains them. Non-palmitoylated full-length and inactive ShhC25S can be converted into bioactive proteins in vitro simply by their N-terminal processing (Jakobs et al., 2017; Ohlig et al., 2012) (Figure 1). A key facilitator of this conversion is the Shh release factor Scube2 (See supplement of Jakobs et al., 2017). Scube2-assisted N-terminal cleavage could thus help convert dominant negative ShhC25S activity in vivo (by blockade of adjacent Ptc-binding sites) into a gain-of-function-phenotype. Notably, Drosophila has no Scube orthologs, which may explain persistent HhC85S dominant negative activity in the fly. Because these data and our interpretation have already been published by our group (Jakobs et al., PMID: 28778988), and because we extensively discussed them in a recently accepted review (Manikowski et al., http://www.mdpi.com/2221-3759/6/1/3/pdf), we prefer not to discuss them again in this manuscript. 1) Reviewer 1 used Figure 4 of Lee et al. (2001) to demonstrate a weak inhibitory effect of anterior overexpression of non-palmitoylated Hh variants in the Drosophila wing. We explain the slight dominant negative ptc-Gal4, HhC85S phenotype by the different integration sites used for transgene generation and the different ptc-driver line used. Yet, exactly as shown in our work, the ptc-Gal4 HhC85S expression phenotype was much weaker than the phenotypes obtained from posterior HhC85S expression, or from omb-controlled expression at the a/p border. We thus believe that discussing the isolated ptc-Gal4;HhC85S result out of its experimental context would be misleading. 2) A second criticism raised by the reviewer is based on a publication of Williams et al. (1999) that does not show stoichiometric suppression of wild-type protein function by non-palmitoylated Hh. We note that the Hhs analyzed in this study were monomeric variants intracellularly expressed in (and purified from) yeast (or E. coli). This system thus does not allow for physiological Hh multimerization at the surface of expressing cells and inhibitory interactions in trans, as required by our model. Therefore, we see no contradiction. 3) The reviewer also refers to Figure 7 in Chen et al. (2004), showing size exclusion results obtained from various expressed Hh, Shh, and variants lacking one or both lipidations. HhC85S forms multimers, consistent with the results shown in our manuscript (Figure 1F, Figure 4—figure supplements 1 and 2, Figure 6—figure supplement 1) – and not contradicting them, as claimed. The linear Hh structure is also not extrapolated but supported by a) established Hh multimerization using linear cell-surface HS chains as scaffolds, and b) our IEM data (Figure 1—figure supplement 1). One side note: Most dual-lipidated Hh, Shh, and monolipidated HhC85S and ShhC25S proteins analyzed by Chen et al. (2004, Figure 7) were monomeric, probably due to the extended (2-day) serum-free expression conditions used – this result should therefore be interpreted with care. 4) Williams et al. (1999) were again cited to suggest that N-truncated proteins are inactive, supposedly at odds with our model. Again, we note that only non-physiological Pichia- or E. coli-expressed monomeric proteins were used in this study. Still, the same paper shows that some N-truncated proteins were bioactive in some in vitro systems, and a non-palmitoylated version lacking 9 N-terminal amino acids was strongly active in vivo (in Ptc-reporter mice, Figure 7 in the work of Williams et al). This demonstrates that in Ptc-reporter mice a) N-palmitate is not directly required for Hh biofunction, consistent with our data, and b) N-truncated non-palmitoylated Hh is bioactive, again consistent with our model. 5) It was further claimed that full-length unlipidated HhC85S is active, as supposedly shown in two reports (Gallet et al., 2003, Figure 2, and Callejo et al., 2006, Figure 6). If correct, this would be in contrast with our data and with reports of others (Chamoun et al., 2001; Lee et al., 2001). Gallet et al. show that HhC85S retains signaling activity in a different in vivo system and by using the ubiquitous 69BGal4 driver. Still, if expressed under en-control at physiologically relevant sites, the potency of HhC85S to activate rho, repress ser, and upregulate ptc is reduced, as also stated in their figure legend and consistent with our findings. The authors further show that an artificial, permanently membrane-tethered Hh form (Hh-CD2) is completely inactive, consistent with Strigini and Cohen (1997) and HAHh results shown and discussed in our manuscript. 6) Finally, the reviewer cannot reconcile reported bioactivity of variably N-terminally lipidated Hhs (or Hhs carrying terminal isoleucines) with our model. Our model predicts that the exact nature of the Hh lipid is not crucial, because palmitate can be potentially replaced by any hydrophobic moiety as long as it tethers the protein to the membrane and does not interfere with shedding. Taylor et al. (2001, but also others: Long et al., 2015) show exactly that: As long as the Hh N-terminus is hydrophobic and the cleavage site accessible (unlike for Hh-CD2 and HAHh), the protein is functional. This does not contradict our model but is in line with it (in contrast to the models of others, claiming that palmitate signals directly to the Ptc receptor (Tukachinsky et al., 2016)). Reviewer 2 suggests a need for follow-up studies of Hh versions expressed from the endogenous locus and visualized in vivo. We will try this experiment in the future. We already tried Hh visualization in the Ptc-internalization-deficient ptc28TPT fly line from Gary Struhls lab; still, at least in our hands, direct Hh stainings in the wing disc were unsatisfactory. Reviewer 2 suggests that the packing seen in Figure 1 might be due to the conformation and size of the antibodies. In the original manuscript and the revised version, Figure 1—figure supplement 1 shows similar data obtained from three different antibodies alone and in combination. To the best of our knowledge, the observed conformations are therefore not a consequence of unspecific antibody clustering. We would like to reply that all constructs are present at the same insertion site and that their comparable expression was confirmed in vitro. In vivo confirmation of comparable expression was tried bud did not yield useful results due to excessive background and unspecific protein staining on Westerns. Transgene expression from endogenous sites, as suggested by the reviewer, is certainly a very good idea and will be performed in the future. The excellent technical and organizational assistance of S Kupich and R Schulz is gratefully acknowledged. The authors thank Marius Mählen for contributing to this work. This work was financed by DFG (German Research Council) GRK1549/1, GR1748/4-1, GR1748/5-1, and CiM FF-2015–02 support. © 2018, Schürmann et al.